Right now, Brownells is running a big sale on Howa Barreled Actions, in a wide variety of chamberings. 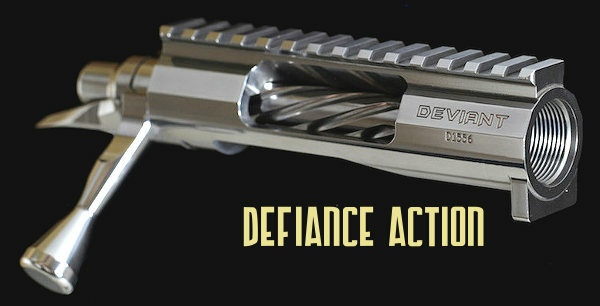 You may want to pick up one of these barreled actions, which start at $259.99. We like Howa actions — they are smooth, and they feature an excellent two-stage trigger. 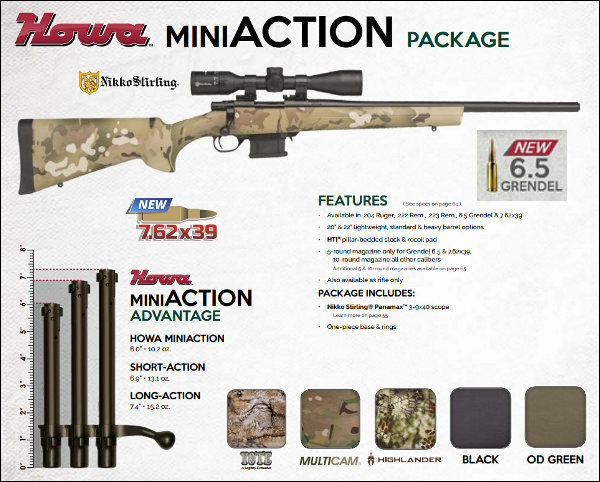 Howa also offers a unique Mini Action, which is great for a small-caliber varmint rig. The above video shows the basics of the Howa barreled actions, which are offered in Mini, Standard, and Long Action versions, with dozens of chamberings, from .204 Ruger all the way up to .300 Winchester Magnum. 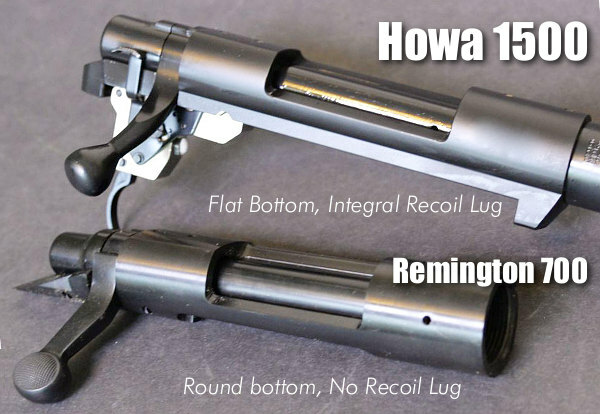 If you’re not familiar with Howa barreled actions you should be. Each barreled action comes with Howa’s Lifetime Warranty and is guaranteed to deliver sub-MOA performance at 100-yards when using premium factory ammo. The Howa 1500 barreled action also features a crisp two-stage trigger, three-position safety, 70° bolt throw, M16-style extractor, two-lug bolt design and a flat bottom receiver with an integral recoil lug. Brownells has created a series of helpful videos showing how to put together an accurate rifle using a Howa barreled action. We think this is a sensible, cost-effective option for a varmint rifle, or entry-level tactical rig. Not counting optics, you should be able to assemble a good shooting, general-purpose rifle for under $700.00. Here the Brownells team puts together a nice tactical rifle in an MDT modular aluminum chassis made specifically for the Howa 1500 action. Attached, AR-style, to the back end of the chassis, is a Luth-AR adjustable buttstock also sold by Brownells. An EGW Picatinny rail is fitted to the action for mounting a Nightforce optic. As you can see in the video, the entire build takes less than 10 minutes. Using this Howa 1500 heavy-barreled action, you can save hundreds over the cost of a factory tactical rifle, and we bet the accuracy will be better than you’ll get with some popular brands. We’ve seen heavy-barreled Howas shoot well under 1 MOA. In this video, Brownells puts together a general-purpose hunting rifle using the Howa 1500 barreled action. This was attached to a Hogue Overmolded stock with internal aluminum bedding block. Fitted to the top of the action is an EGW Picatinny Rail with a Sig Sauer scope in Leupold rings. As with the Precision Rifle build above, the entire assembly process took less than ten minutes. This was done with a standard-length Howa action, but the same procedure could be used with the Howa Mini Action, or a Long Action. NOTE: No separate bedding compound was used here. That’s an option that would extend build time significantly. Share the post "Build Your Own Rifle with Affordable Howa Barreled Actions"
Three factory ammo types shot 0.53″, 0.55″, and 0.57″ respectively. That’s impressive. Chassis rifles are hugely popular for PRS/NRL practical rifle competition. There are many good options for Production Class. You may not know that Weatherby, a company that built its reputation on hunting rifles, offers a great-shooting chassis rifle for PRS comps and other tactical disciplines. Called the Vanguard® Modular Chassis (VMC), this rig has shown remarkable accuracy. Vanguard’s VMC features a Modular Driven Technologies (MDT) aluminum stock, Luth AR MBA-1 buttstock, and 22″ heavy barrel. The Weatherby Vanguard action is fitted with an adjustable 2-stage trigger. Priced at $1519.00 MSRP, this rifle can be campaigned in the PRS “Production Class”, which limits complete rifles to $2000.00 without optics. The rifle is offered in three chamberings: .223 Rem, 6.5 Creedmoor, and .308 Winchester. 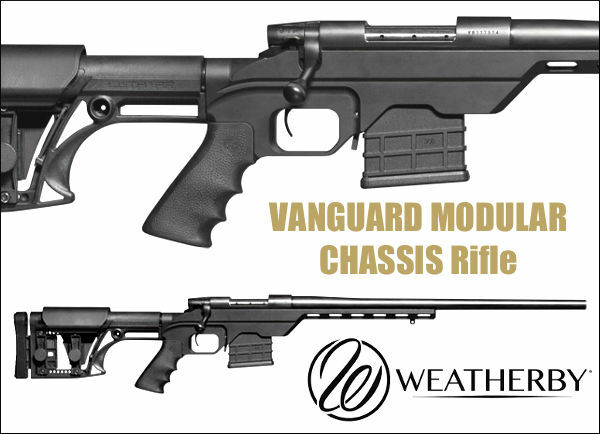 Weatherby says its Vanguard Modular Chassis tactical rifle is very accurate. To back that claim, Weatherby offers a SUB-MOA accuracy guarantee — Weatherby guarantees the rifle will shoot .99” or smaller 3-shot groups at 100 yards when used with Weatherby® factory or premium ammunition. It turns out Weatherby’s accuracy claims are conservative. 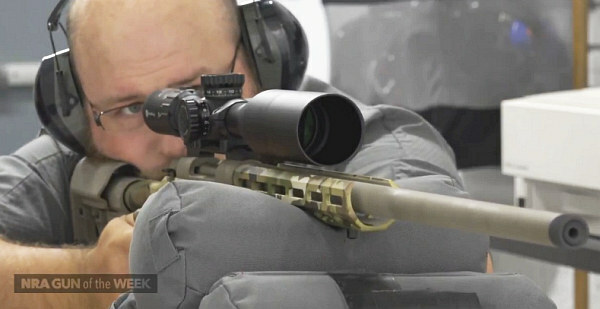 This tactical rifle is closer to a half-MOA rig than a 1-MOA gun. American Rifleman tested a .308 Win version of this rifle and recorded really stellar accuracy — close to half-MOA. What’s more, this rifle is not fussy — with a 1:10″-twist barrel it proved very accurate with six types of factory ammo, with three of types registering 0.57″ or better. The rifle delivered near-half-inch 5-shot groups with two types of Hornady ammo along with Black Hills 168gr. The worst group of six ammo types tested, Black Hills 175gr, was 0.76″, still very impressive for factory fodder. With good hand-loads this gun could go well under half-MOA (for five shots). 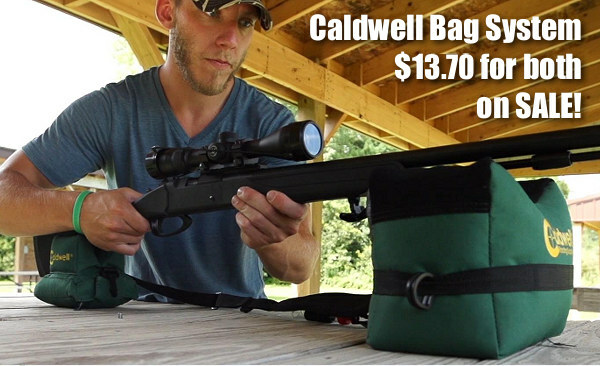 NOTE: Group sizes are for 5-shot groups shot from bench at 100 yards with Caldwell pedestal rest and rear sandbag. Pentax Lightseeker 6-24x50mm scope. Velocities in FPS from PACT Chronograph. Production Division rifles are not permitted to be altered or improved in any way from the original factory configuration. Share the post "Half-MOA with Factory Ammo? Weatherby VMC Comes Close"
Are you looking for a new varmint rifle for next season, or perhaps you’re shopping for a “first rifle” for your son/daughter, or young relative, as a Christmas gift. Then consider the Howa Mini Action. This unique product, with a very compact action, offers excellent value for the money. The actions are smooth, the triggers are good, and the accuracy is typically better than you’ll get from most domestic rifle makers. We’ve been fans of the Howa Mini Action rifles since they were first introduced. 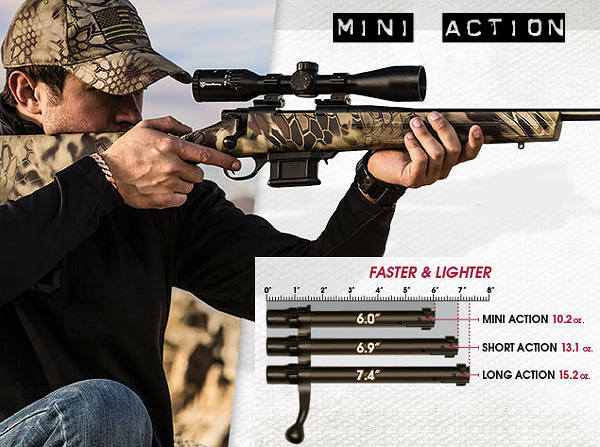 With actions that are nearly an inch shorter than typical “short actions”, these Mini Action rigs work great as a compact “truck gun” or carry-around varminter. Current chamberings are: .204 Ruger, .222 Rem, .223 Rem, 6.5 Grendel, and 7.62×39. There are 20″ lightweight, 20″ heavy contour, and 22″ standard contour barrel options. The Howa Mini Action rifles come with the excellent HACT 2-stage trigger and a 5-round or 10-round, synthetic detachable box mag (depending on caliber). The Mini Action’s bolt is 13% shorter than on regular short actions, providing a shorter, faster bolt throw. Weight is also reduced. This makes for a nice, compact (and very shootable) package. Click HERE for full-screen image. 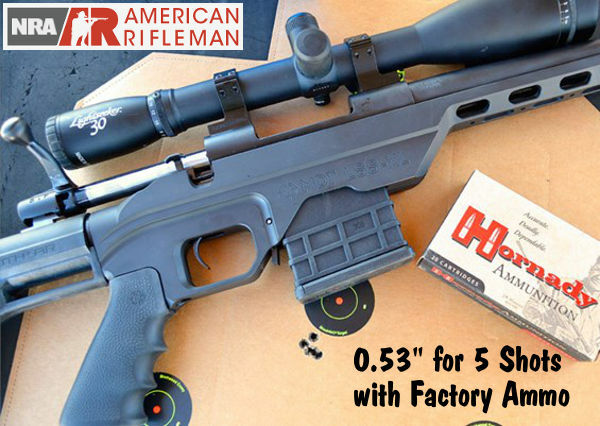 Share the post "The 6.5 Guys Review Howa Mini-Action Rifles"
Grafs.com is running two great 10% Off Sales through 8/8/18. First, ALL in-stock Lapua products are 10% Off — yes that includes brass, bullets, and loaded ammo. Serious shooters know that Lapua makes superior cartridge brass, great bullets, and some of the very best loaded ammo you can buy. Grab some great Lapua brass soon — the sale stops at 11:59 pm CT on August 8, 2018. The second big Grafs.com sale is on bipods, tripods, monopods, shooting sticks, front rests, rear rests, and bags. Basically any product designed to support the front or rear of your rifle is marked down 10%. 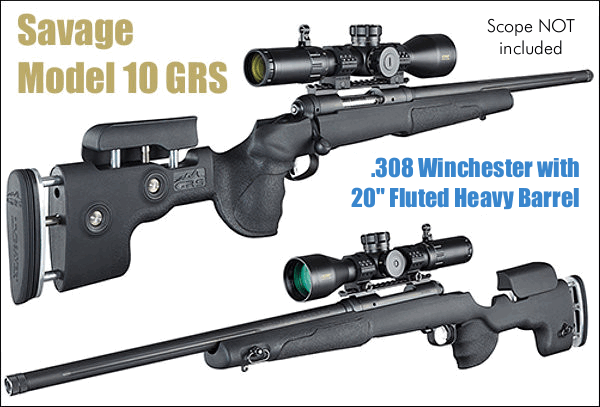 Graf’s big Shooting Rest Products Sale also runs through 11:59 pm on August 8th. Looking for quality bullets for your 6.5 Creedmoor or 6.5×47, but can’t afford the Big-Name 6.5mm match bullets that cost up to $50 per 100-ct box? You’re in luck. 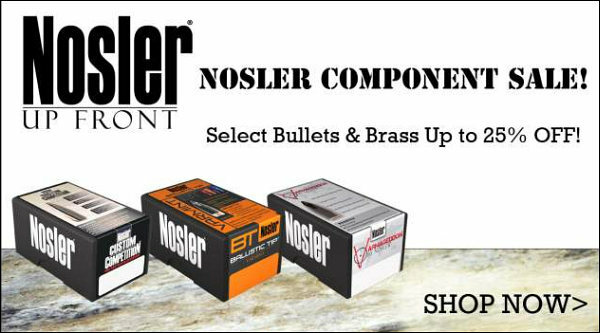 Now with this Midsouth Sale, you can get 500 quality, Nosler-made 6.5mm bullets for just $119.99. That works out to just $23.99 per 100 — less than half the price of some other bullet brands. Choose either 123gr at $119.99/500 or the 140gr at $124.99/500. If you are shooting at steel in the PRS game, these bullets should give you all the accuracy you need. Put the money you save into barrels and optics. The brand new Ruger Precision Rimfire has become one of 2018’s most popular rifles. This .22 LR rig offers a turn-key rimfire solution for tactical shooters, PRS competitors, and anyone who likes modular rifles. The Ruger Precision Rimfire rifle offers adjustable cheekpiece and length of pull, AR-style grip, free-floating M-Lok fore-end, and an 18″ barrel (1:16″ twist) pre-threaded for brakes or suppressor. CDNN Sports sells this versatile, bolt-action rimfire rig for $399.99. Right now you can order the 36-power Weaver T-Series XR scope for just $389.99. That’s an awesome, but act quick — this price could change. Natchez currently has the silver 36x40mm Weaver XR for just $389.99 — a fantastic price. 36X is enough power for benchrest competition. And even if you don’t shoot benchrest, this is a great scope for load development or general accuracy testing. The 36-power T-Series scopes have a 40mm front objective and side-focus parallax control. You can also get this XR 36x40mm scope in black for $499.99. 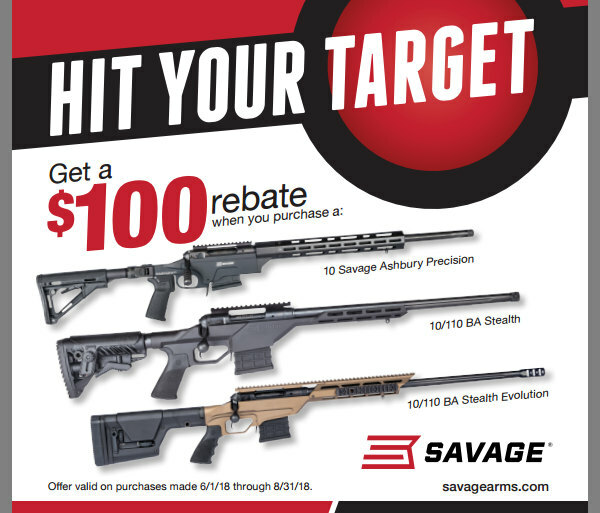 Purchase a Model 10 Savage® Ashbury Precision, 10/110 BA Stealth, or 10/110 BA Stealth Evolution and receive a $100.00 Factory Rebate. These rifles are available in a variety of chamberings. FFL Dealer required for purchase. The Model 10 BA Stealth Evolution in 6.5 Creedmoor would be a good entry-level platform for PRS factory class. Expect to pay under $1000 net with the $100 Rebate. This Savage rebate program runs though August 31, 2018. GET REBATE FORM. Thinking of getting started in the Practical/Tactical shooting game? Looking for ways to be more stable when shooting from unconventional positions? 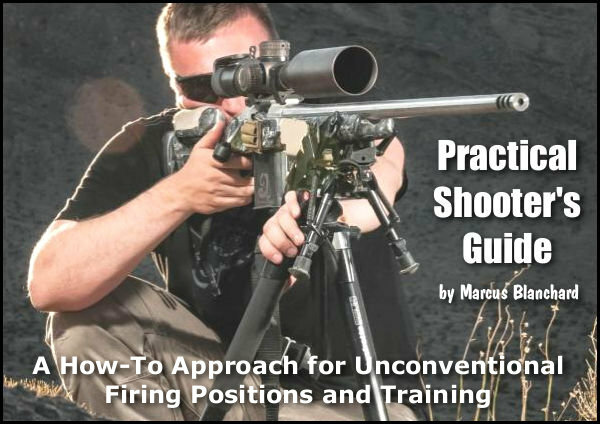 Then you may want to read Marcus Blanchard’s Practical Shooter’s Guide (A How-To Approach for Unconventional Firing Positions and Training). Unlike almost every “how to shoot” book on the market, Blanchard’s work focuses on the shooting skills and positions you need to succeed in PRS matches and similar tactical competitions. Blanchard provides clear advice on shooting from barricades, from roof-tops, from steep angles. Blanchard says you need to train for these types of challenges: “I believe the largest factor in the improvement of the average shooter isn’t necessarily the gear; it’s the way the shooter approaches obstacles and how they properly train for them.” Paperback version is $19.99 while the eBook (Kindle) version is $9.99. Share the post "Bargain Finder 150: AccurateShooter’s Deals of the Week"
The Browning Buckmark is a classic .22LR pistol. Ergonomic, accurate, and reliable, the Buck Mark is a worthy addition to any gun collection. And now you can get a Buck Mark for under $250.00. 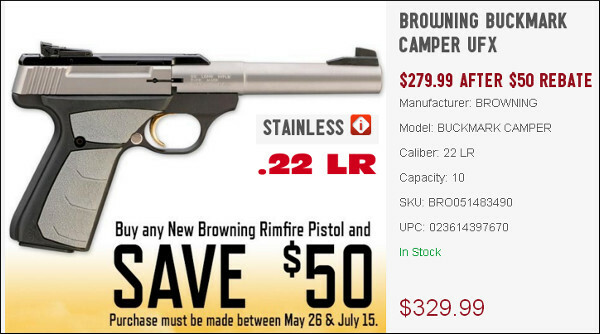 Bud’s Gun Shop is selling the Buck Mark Camper UFX for $299.73 (or $291.00 cash price). 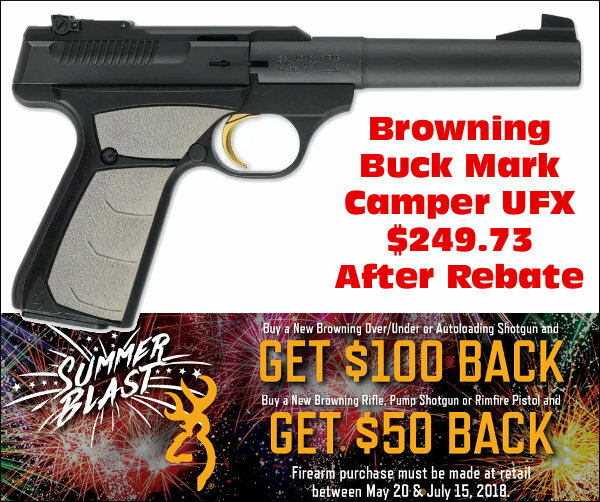 Additionally, Browning is now offering a $50 Summer Blast Rebate that lowers your net cost to $249.73. But act soon, to qualify for the $50 Factory Rebate you must purchase by July 15. NOTE: Browning is also offering $100 Rebates on shotguns and $50 Rebates on rifles. This is a functional, “field expedient” system that’s easy to haul around and only costs $13.70! Varminters can keep these bags in a vehicle for deployment any time. Act quick — this is a special sale price at Amazon.com. This unfilled bag combo sells for up to $33.00 elsewhere. Yes this is a very inexpensive system, but it works surprisingly well, particularly with “standard” rifles with narrow fore-ends. Rather than sand, you can fill with rice or media to make the bags lighter. This system features a heavy-duty clip and D-Ring for linking the two bags for easy transport. The Caldwell DeadShot bags are crafted from durable, water-resistant 600 denier polyester. The dimensions of FILLED BAGS are: FRONT 11″ x 8.5″ X 6″; REAR 5″ x 5″ x 4.5″. 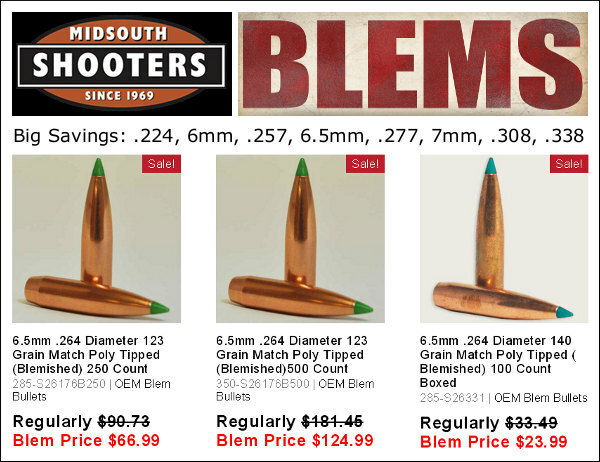 Midsouth is now offering big savings on major-brand blem bullets. These are overruns, cosmetically blemished jackets or tip discolorations, or factory second bullets from a major bullet manufacturer (Midsouth isn’t allowed to name the company). NOTE: Some projectile tips are misshapen, other packages may contain bullets which vary by grain weight. No matter what, you’re getting tipped hunting, or tipped match bulk bullets at huge savings. Many options in .224, .243 (6mm), .257, .264 (6.5mm), .277, .284 (7mm), .308, and .338 calibers. This is hard for a varmint hunter to resist. You can get a complete Howa .223 Rem rifle for $349.99 — about the price of a replacement barrel blank for a Remington. This little gem has a smooth, short-throw Mini Action with Howa’s excellent two-stage trigger. The .223 Rem is a fine choice for prairie dog work, with good barrel life and great factory ammo options. Yes we’d prefer a heavier barrel for extended shooting sessions, but this is still a great price on a fine little rifle. Here’s a great deal on NRA Life Membership. 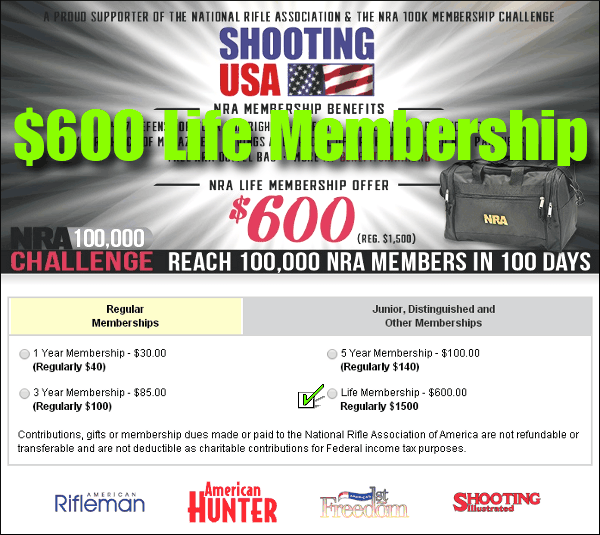 Right now you can get the NRA Life Membership for $600.00 — that’s a $900 savings over the regular $1500.00 NRA price. This a special offer through Shooting USA television. NOTE: The shorter term 1-year, 3-year, and 5-year NRA memberships are also discounted. For example the basic 1-year membership is discounted to $30.00, a $10 savings. NOTE: NRA Memberships no longer include $2500 Armscare Insurance. Midsouth offers 250 self-adhesive Benchrest Targets on a convenient roll. 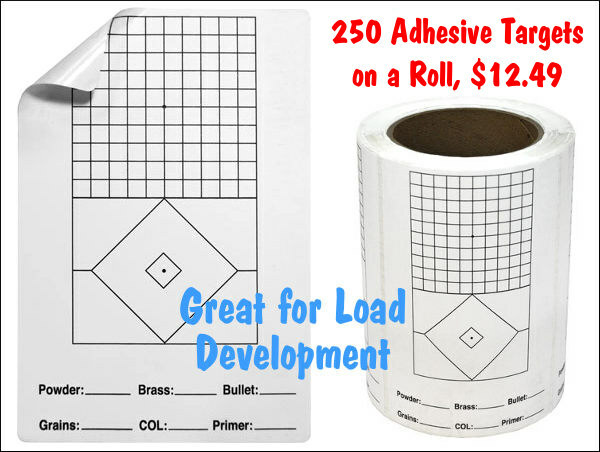 These stick-on targets work great for load development. The aiming diamond helps align the cross hairs of your scope for consistent shot placement. If you set your Point of Impact to the 1/4″ grid pattern at the top it’s easy to eyeball your group size. At the bottom are fields for your load info. Each Target sticker measures 6″ x 4″ with a 4.5″ x 2.5″ printed area. Midsouth sells the 250-target roll for $12.49, discounted this week from $14.99. Share the post "Bargain Finder 146: AccurateShooter’s Deals of the Week"
You could actually win a PRS match with this rifle, a Howa KRG Bravo rig in 6.5 Creedmoor. Yet, at $999.99, this KRG Bravo is one-third to one-forth the price of custom tactical rigs (less optics). This Howa was chosen as the official factory rifle for the National Rifle League (NRL), and we can understand why. With the KRG Bravo, you get a complete rig with a smooth-running action, nice two-stage trigger, AICS mag compatibility, good ergonomics, and competitive accuracy — all for less than you’d spend for a custom tactical action by itself. The polymer KRG stock features an aluminum internal sub-chassis. NOTE: Brownells also sells a KRG Bravo 6.5 CM rifle with a 26″ barrel for $1127.99. Both 24″ and 26″ lengths will shoot well, but the 26″ should deliver about 30 FPS more velocity. It’s really a matter of your budget and personal preference. Here’s a killer deal on a Front Focal Plane (FFP) optic good for PRS competition and tactical applications. The Vortex Viper PST 6-24x50mm scope features 0.1 Milrad clicks with an EBR-2C illuminated reticle with Mil-based hash marks. This reticle also features the “Christmas Tree” type lower half, which provides range hold-overs with horizontal markings for wind holds. Not that long ago, this scope sold for around a thousand bucks. Now you can get the Vortex Viper PST 6-24x50mm for just $619.99. That’s a great price for a PRS-ready FFP comp scope with a proven track record and rock-solid Vortex warranty. This price is for Pre-Orders, with inventory coming soon. EuroOptic’s Sale price is $649.99. Use Code POVIPER during check-out to save another $30.00. If you are looking for popular Alliant powders, now’s a good time to buy. 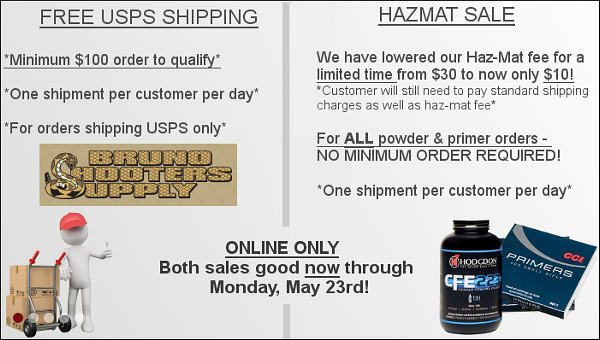 Midsouth Shooters Supply has discounted its inventory of Alliant powders, plus there is a $2 per pound factory rebate. So, for example, the sale price might be $1.50 off regular retail, and then Alliant gives you another $2.00 back for every pound you buy (up to 10 pounds or $20 total rebate). But act soon — this Powder Promotion ends June 30, 2018. Natchez has obtained a supply of British MOD Surplus SKB 5041 rifle cases. These were ordered as mine detector cases, but were never issued. Natchez has removed the foam cut for the detectors and replaced it with brand new 2-piece convoluted foam. 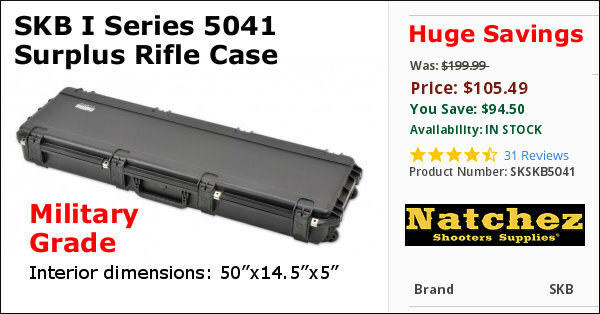 Interior dimension of the case is 50″x14.5″x5″ INSIDE so this will hold long-barrel match rifles comfortably. These are extremely high-quality cases, very tough and rugged, waterproof with gaskets. These cases feature four SKB patented trigger latches, four reinforced padlock locations, and inline wheels. Though in excellent condition, some case may have minor exterior scuffs. You won’t find a better case at anywhere near the $105.99 price. These normally retail for $199.99. Need a good, modern electronic scale/dispenser? The modern ChargeMaster Lite offers good performance for the price — now $186.99 at Amazon and $187.49 Brownells. But at Brownells, with Code NCS you can get $15 off and free shipping — lowering your net cost to $172.49! That’s a killer deal — other retailers are charging up to $260.00 for this machine. Once calibrated, we found the ChargeMaster Lite’s dispensing to be very accurate. 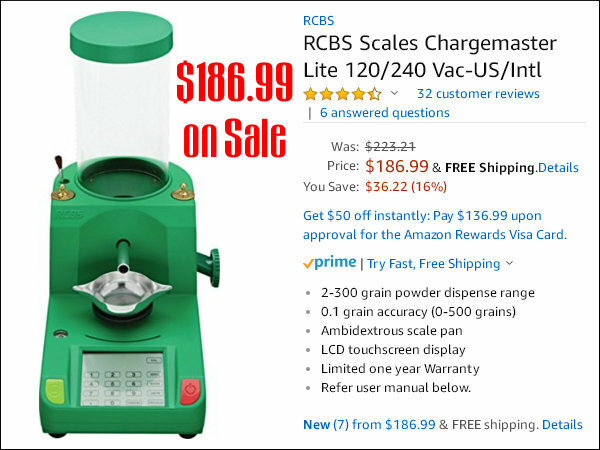 RCBS claims +/-0.1 grain. This newer machine is a bit easier to program than the original ChargeMaster. Verified purchasers have been happy, but with one complaint: “You cannot turn off the beeping. The [original ChargeMaster] has a way to mute the beeping. This one does not.” Take note. Right now you can order the 36-power Weaver T-Series XR scope for just $389.99. That’s an awesome, but act quick — this price could change. Natchez currently has the silver 36x40mm Weaver XR for just $389.99 — a fantastic price. 36X is enough power for benchrest competition. And even if you don’t shoot benchrest, this is a great scope for load development or general accuracy testing. The 36-power T-Series scopes have a 40mm front objective and side-focus parallax control. You can also get this XR 36X scope in black for $439.99. MidwayUSA is now selling pistols, rifles, and shotguns. Offering firearms for sale is a return to MidwayUSA’s roots. The company actually started out as a small gun shop 41 years ago. Since then the company expanded first to catalog sales, and then became one of the largest shooting sports online retailers. Now MidwayUSA will be offering a full line of firearms, with promotional offers directly from suppliers and manufacturers. We took a quick look — the selection of firearms is outstanding, but you may find better pricing elsewhere. As with anything, it pays to comparison shop. CLICK HERE for MidwayUSA’s online gun shop. We like these bright, Neon 3″ target stickers. They are big enough to see easily at 600 yards, giving you a 1/2 MOA target center at that distance. For $14.95 at Amazon.com, you get 250 3″-diameter self-adhesive centers (125 targets per roll) that stick to almost any surface The high-contrast fluorescent red/orange color provides an excellent HI-VIZ aiming point, along with good contrast for bullet holes that fall within the 3″ circle. To help line up your reticle cross-hairs, the target centers feature black markers at 3, 6, 9, and 12 0’Clock. NOTE: These stickers may qualify for FREE Shipping with combined orders over $25.00. Share the post "Bargain Finder 144: AccurateShooter’s Deals of the Week"
This GRS-stocked Savage can get you into the F-TR game for around a grand (Buyer’s Club price is $999.47). Add a 26-28″ premium, aftermarket Krieger barrel and we bet this Savage could compete with some custom F-TR rifles costing twice as much. Use the original fluted 20″ .308 Win barrel for hunting or tac comps. The GRS Berserk stock is great (at least for right-handers). The grip is very comfortable and you can instantly adjust Cheekpiece Height and Length of Pull (LOP) with the push of a button. 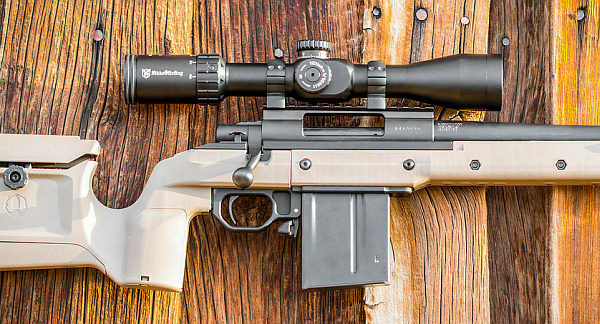 This GRS stock is plenty strong — it won’t flex when shooting from bipod. This is a very good deal. The same .308 Win Savage Model 10 rifle sells for $1299.99 on Cabelas.com. 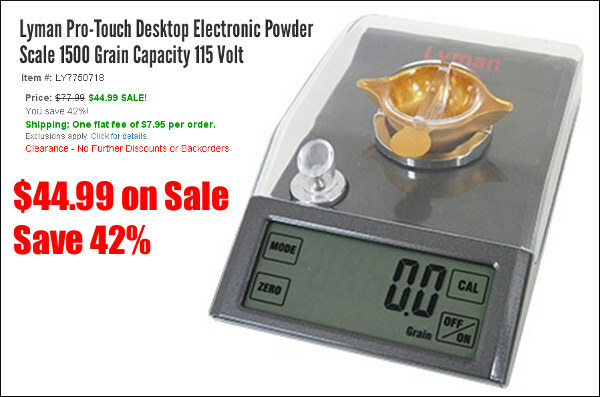 We like this little Lyman Pro-Touch scale for the price — $44.99. No this compact digital scale won’t compete with a $700 Force Restoration balance that can measure a half-kernel. But this little Lyman is good enough for range loading, and for other tasks, such as sorting bullets and brass by weight. Graf’s $44.99 price is a genuine bargain. Lyman says the scale has “accuracy to 1/10th grain with anti-drift technology”. It can run with supplied AC adapter or three AAA batteries. 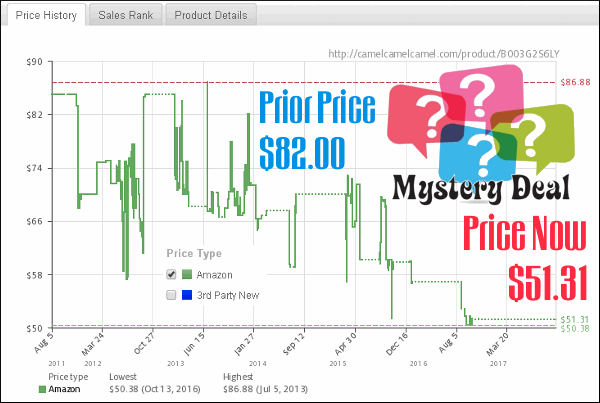 This very same scale sells for $79.59 right now on Amazon. You can save over 40% by buying from Grafs.com this week. This is big news. Bullets.com, a leading vendor of components, reloading supplies, and tools, is closing up shop. Some of the product lines will still be carried by Grizzly.com, but bullets, brass, powder, and ammo inventories are being liquidated along with many reloading products and gunsmithing tools. You’ll find huge discounts on many top-tier products — such as Lapua brass, Berger bullets, and Hodgdon powder. Some big-name items are selling now below cost. Our Forum members have been grabbing up brass and bullets, but there are still deals to be had. Every serious shooter should visit Bullets.com right now to take advantage of these one-time super savings. We’re very sad to see Bullets.com close up shop, but their loss is your gain. Jump on these deals while you can. With this deal you can get a complete 6.5 Grendel Howa 1500 rifle (Mini Action) with HACT 2-Stage Trigger for just $349.99. That’s $57.00 less than the price of a Howa 1500 barreled action by itself without the nice green stock! ($407.00 at Brownells). This is a no-frills rifle, but its hard to beat the $349.99 price for a solid, multi-purpose rifle. Use “As-Is” for hunting or drop it into a modular stock for tactical/practical games. These are smooth-running actions. NOTE: This Howa 1500 Mini Action rifle is also available in .223 Rem for $349.99. Here’s a GREAT deal on name-brand .22 LR Plinking ammo — 525 rounds for $23.99. That’s just 4.5 cents per round (and the Members price is even lower — just $22.79). We’ve tried this copper-nosed .22 LR rimfire ammo in pistols, boat-action rifles, and semi-auto rifles and it functioned fine. 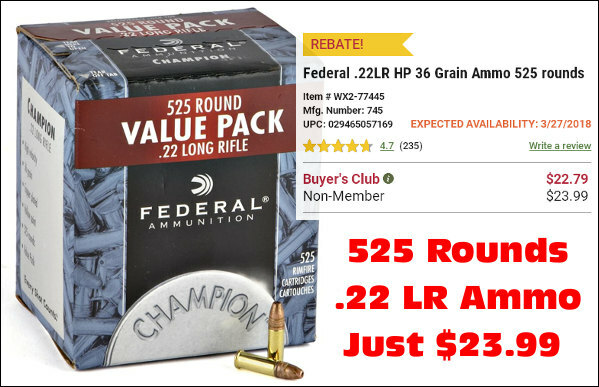 Hard to beat this price — $23.99 for 525 rounds with no limit on the amount you can purchase. This Federal Value Pack contains 525 rounds of reliable .22 LR rimfire ammo loaded with 36-grain hollow-point bullets, suitable for target shooting and plinking. 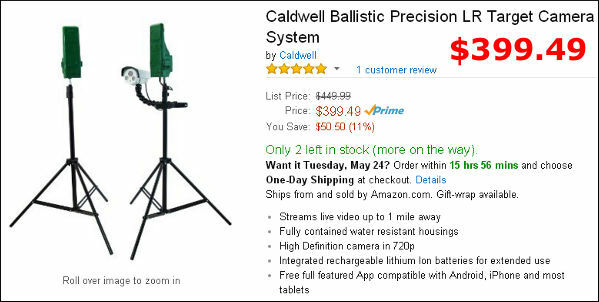 Item: # WX2-77445 NOTE: This ammo also qualifies for FREE Products if you spend at least $75.00. This may be the best optics rebate you’ll see all year. 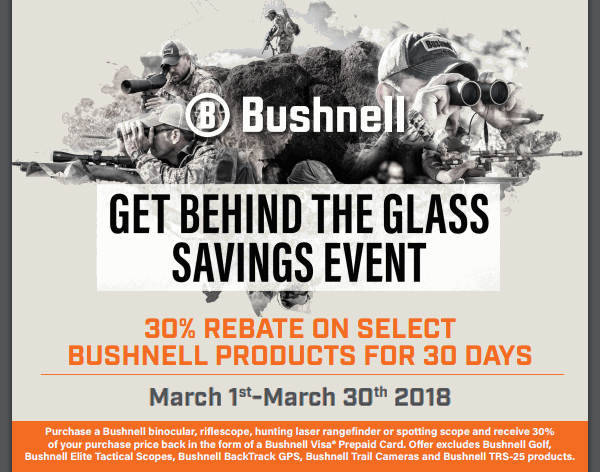 Now through March 30, 2018, Bushnell will rebate thirty percent (30%) of the purchase price of a qualifying Bushnell optics product. This 30 for 30 Promotion applies to select Bushnell binoculars, riflescopes, laser rangefinders, or spotting scopes. After purchase, submit the rebate form and you’ll receive 30% of your purchase price back in the form of a Bushnell Visa Prepaid Card. You can save a bundle with this rebate. NOTE: Offer excludes Bushnell Golf, Bushnell BackTrack GPS, Bushnell Trail Cameras, Bushnell Elite Tactical Riflescopes, and Bushnell TRS-25 products. GET REBATE FORM. If you have been waiting to get a Magnetospeed… wait no longer. 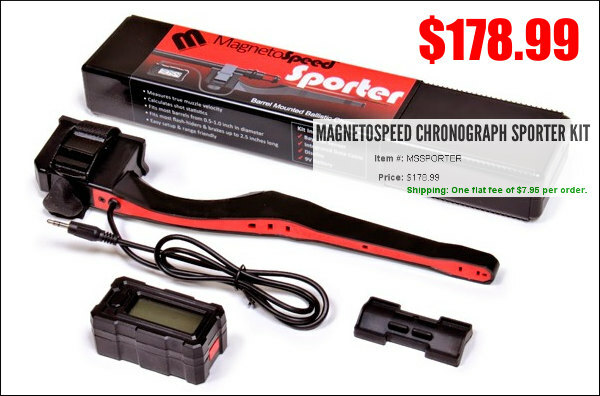 Priced at just $178.99 at Grafs.com, the Magnetospeed Sporter model costs less than half as much as Magnetospeed’s V3 models. This chronograph attaches directly to your barrel so you don’t have to go downrange to position tripods and set up skyscreens. For most people the Sporter Model contains all the features they need. Using Magnetospeed’s XFR adapter (sold separately), data can be transferred easily from the display module to your mobile device. READ Magnetospeed Sporter Review. 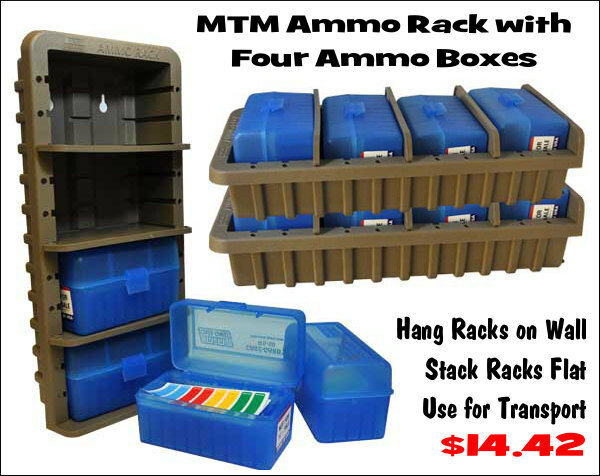 MTM’s innovative new Ammo Rack holds four 50-round ammo boxes, which are supplied with the Rack. This is a good deal at $14.42 for rack AND 4 ammo boxes. Made from high impact polypropylene, MTM Ammo Racks can be stored standing, stacked flat, or hung on a wall to save space and keep your ammunition handy. The Rack’s internal shelves are adjustable for different combinations and four holes are molded into the back for secure mounting to a wall. This MTM ARRS-model Ammo Rack comes with four RS-50 blue ammo boxes that will each hold fifty round of .221 Fireball, .223 Rem, 204 Ruger, or 6×47 Lapua ammunition. These Six-inch “splatter” targets display a bright yellow ring around each bullet hole. We like these adhesive Glow Shot targets for practice at 300-600 yards. The neon yellow on black provides high contrast so you can easily see 6mm bullet impacts at 600 yards. 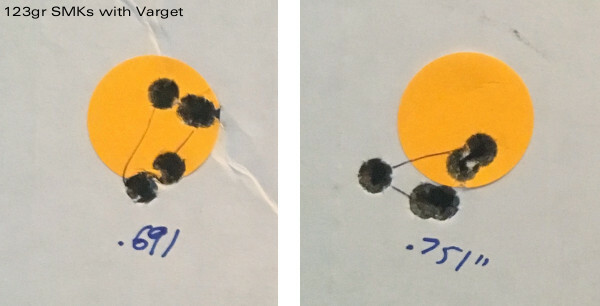 The 6″-diameter is one-MOA at 600 yards — a good aiming center size. Priced at just $14.99 for a sixty-count package, these are a good value compared to the larger Birchwood Casey Splatter Targets. 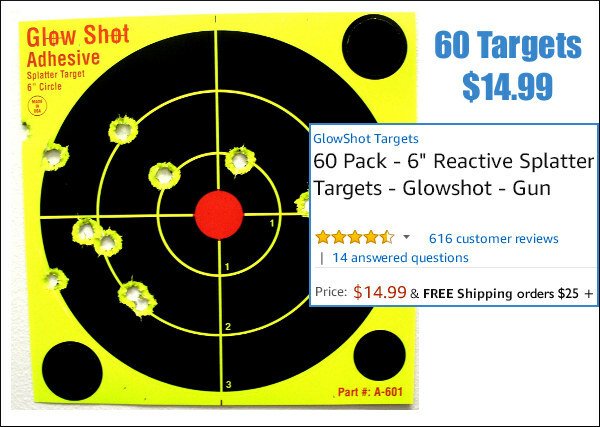 Note: This Glow Shot target is also available in a Red Circle version, and Tri-Color version (red, yellow, and green). Share the post "Bargain Finder 129: AccurateShooter’s Deals of the Week"
With the support of these sponsors, the 6.5 Guys have collected over $10,000 worth of prizes. Here is your chance to win some great prizes, including a Bergara B14 Rifle, Defiance Action, Nikon FX1000 Scope, Manners Stock, KRG Chassis, and over 30 more great products. All combined, these prizes are worth over $10,000. 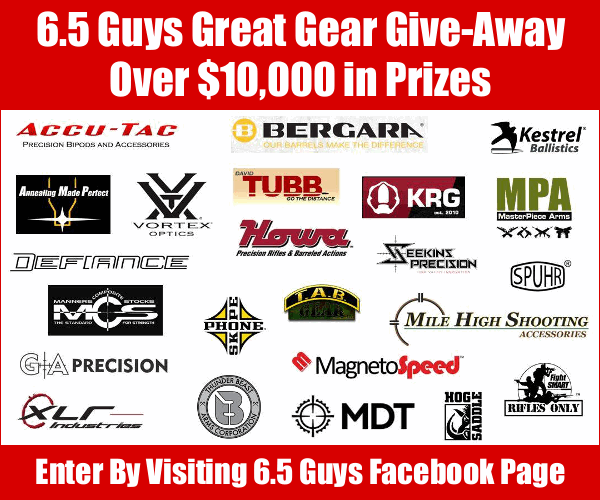 All prizes will be given away to visitors to the 6.5 Guys Facebook page who comment on the 6.5 Guys’ SHOT Show videos. No purchase necessary. Winners will be selected next Saturday, March 17, 2018. NOTE: Readers don’t hesitate. This is a great opportunity. For some of the prizes there are less than 80 commenting entrants now, so your chances are very good indeed! 1. Go to 6.5 Guys Facebook Page. 2. Watch one or more linked 6.5 Guys SHOT Show Videos. 3. Comment on the Videos on Facebook, and tell two Facebook Friends. The more videos you comment upon, the better your chances of winning! To qualify to be selected in each random drawing for a prize, participants must complete the following tasks for each vendor promotion. First, “Like” the 6.5 Guys Facebook page and the vendor’s Facebook page. Second, leave a comment on the original 6.5 Guys’ post for the vendor’s SHOT Show prize promotion that includes a hashtag “shout out” to the donating company. Finally, you are asked to tag two friends on Facebook that could also benefit from the prize(s). Everyone should be sure their LIKES and COMMENTS are within the original post(s) on the 6.5 Guys’ Facebook in order to qualify to enter the drawing(s). That’s it. For details on what products will be available to win and how to participate in each drawing, refer to the instructions on each of the SHOT Show videos on the 6.5 Guys’ Facebook page. All prizes will be awarded through a series of random drawings to take place during a Facebook live event to be held on Saturday, March 17th 2018 at 5:00 PM Pacific. Participants must be 18 years of age and reside in the USA. To learn more about prizes and how to participate in each drawing, refer to the detailed instructions on each of the SHOT Show videos on the 6.5 Guys’ Facebook page. Fine print: 6.5 Guys, LLC reserves the right to modify the product description at any time for clarity or for any other reason deemed necessary. 6.5 Guys is coordinating the random selection of winners for each promotional drawing and will provide the winners’ contact information to each vendor for fulfillment of prizes. Adherence to all applicable laws and regulations, including those pertaining to the transfer of firearms, NFA items and ITAR regulated items, is the responsibility of the winner and the vendor. 6.5 Guys LLC does not provide any express or implied product warranties or endorsements of any type. Share the post "6.5 Guys 2018 Great Gear Give-Away — Enter to Win"
Here’s important news for tactical shooters. There’s a rival to the Precision Rifle Series (PRS), the National Rifle League (NRL). 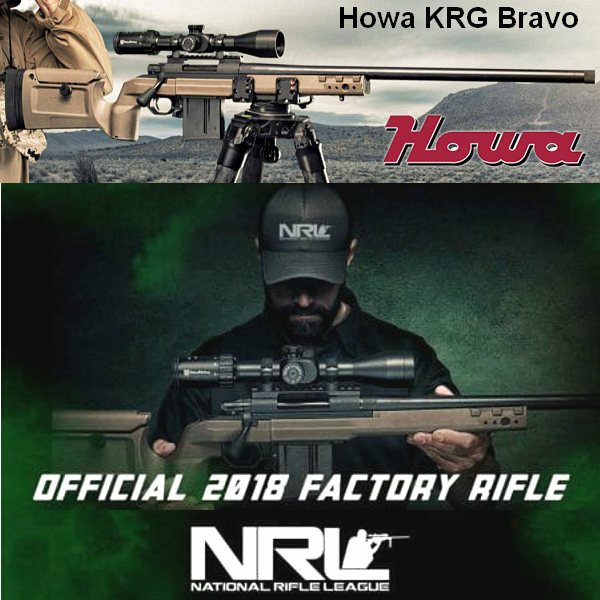 And now the NRL has a major rifle sponsor — Howa. This Japanese rifle-maker will support the NRL’s 2018 season as Official Factory Rifle Sponsor. Good choice. 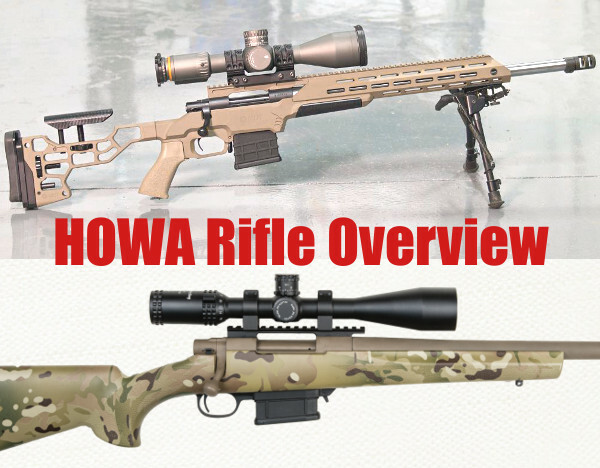 We’ve shot Howa 1500-series rifles, and we know they offer excellent performance for the price. You can buy a complete Howa tactical rig, such as the KRG Bravo, or get a barreled action and put it into a variety of third-party modular stocks. 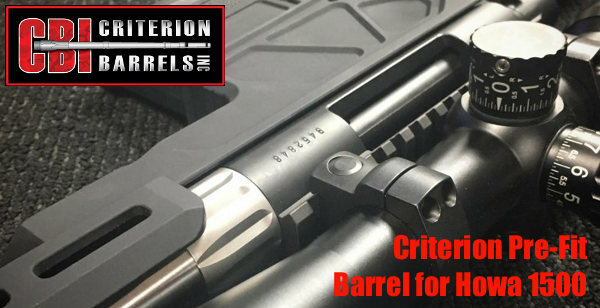 Plus Criterion Barrels now offers Pre-Fit barrels in a variety of chamberings for Howa 1500 actions. For 2018, the NRL will host 15 Precision Rifle matches, and the NRL 2018 Championships will be on October 19th – 21st in Idaho. There Howa will provide valuable prizes for top competitors. CLICK HERE for more information on the NRL 2018 match schedule. Howa Machinery has been exporting sporting rifles for more than four decades since its first unit shipped in 1967. The Howa Model 1500 boast a smooth-running action and a fine two-stage HACT trigger (that’s a lot better than the standard trigger in most other factory rifles). For 2018, Howa is moving into the tactical/practical Precision market with a full line of competition ready rifles. “We are very excited to be a part of the National Rifle League for 2018. We had the opportunity to be a part of a few matches in 2017 and the response was amazing. 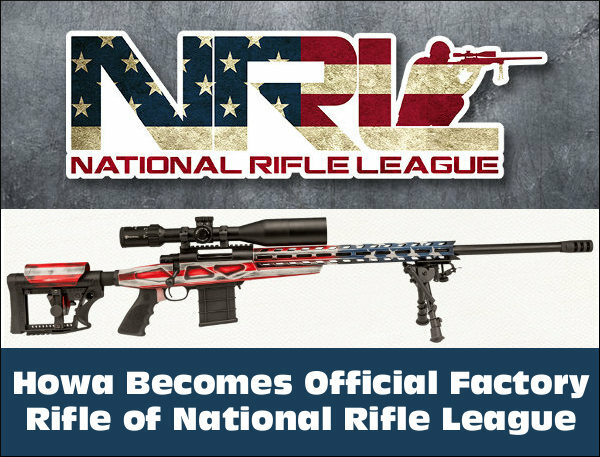 We view the NRL as an opportunity to connect with precision rifle shooters all around the country and share our passion for bolt-action rifles and the competition camaraderie.” Stated Mathew Hornback of Howa USA. 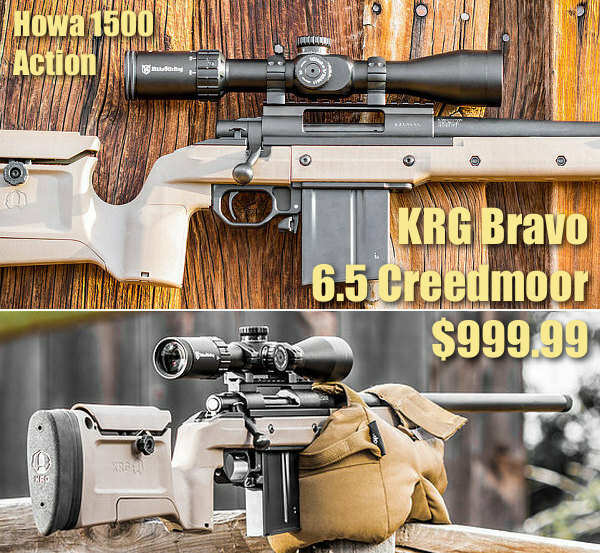 Share the post "Howa 1500-Series Rifles for National Rifle League"
Rifleshooter.com built this tactical rifle (top image) with a Howa 1500 action, Shilen barrel, and MDT chassis. Below is a factory Howa 1500 Multi-Cam rifle. 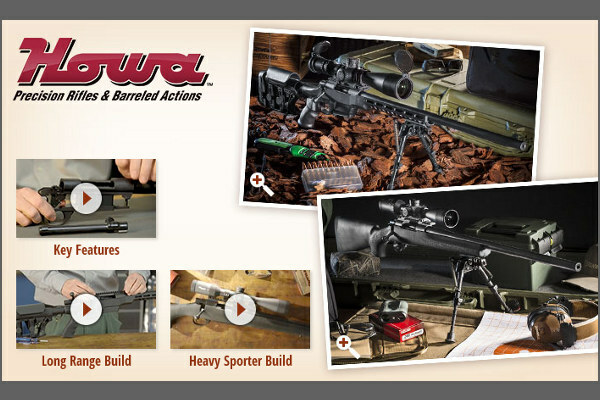 Many of our readers are thinking of purchasing a Howa rifle or barreled action. These feature smooth-running actions with a good two-stage HACT trigger. But some folks have heard that it may be difficult to find stocks, or to fit an after-market barrel. That’s not true. 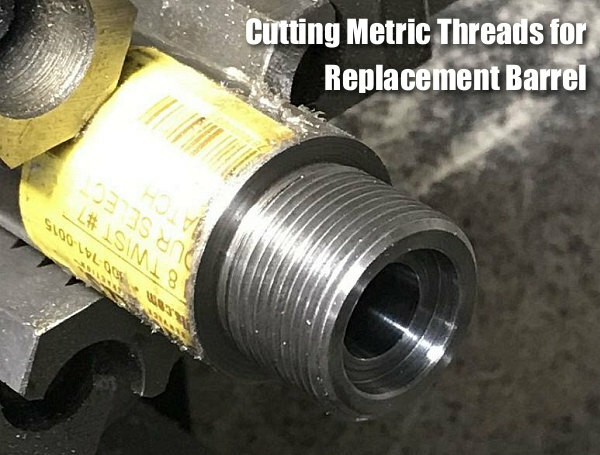 There are many stock options available, and in this article, Bill of RifleShooter.com shows that it is easy to remove the factory-installed barrel with the right tools. We think a Howa makes a fine basis for a varmint rig or field rifle. Or you can build a tactical as Bill did. You can start with the factory barrel and when you want/need more accuracy, then have a gunsmith install a custom barrel from Krieger, Shilen, or other quality brand. Consider this article the “Howa 1500 Overview”. AccurateShooter.com’s editor mentioned there’s been a lot of interest in Howa rifles and barreled actions imported by Legacy Sports International. In addition to being able to buy a complete rifle from a dealer, Brownells sells barreled actions in a wide variety of calibers and configurations. 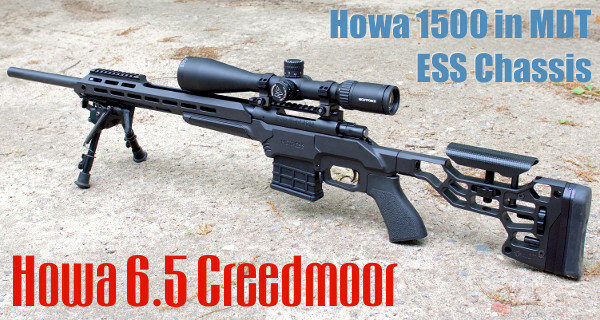 In this post we are going to take a look at the Howa 1500 series. Howa is a Japanese heavy machinery company. One of its product lines are firearms, which, are imported into the United States of America by two different companies, Legacy Sports International and Weatherby. Legacy sells the 1500 under the manufacturers name while Weatherby re-brands the guns as the Weatherby Vanguard. In general, the finishes on the Weatherby rifles are more refined than the LSI-imported 1500s. I’ve found Howa 1500s to be solid, entry-level rifles that are capable of sub-MOA accuracy out of the box. I’ve actually purchased two Howa rifles I’ve tested because I like them so much. The gun below, a Howa Mini-Action in 7.62×39 Russian, is one of my favorite factory guns to shoot. I’m running a Tract Optics Toric on it, these are solid little rifle scopes that offer great performance for the money. Check out this three-shot group I drilled at 100 yards with the rifle above and 125-grain Sierras. It took a lot of work and load development to get there, but when it did, it worked well. Howa 1500s feature the very nice Howa HACT trigger. This is an adjustable, two-stage trigger, set for about 3 pounds (combined stages). Crisp and repeatable, this is an excellent trigger for a factory gun. There is no annoying Glock-style safety lever in the middle of the trigger blade. The 2-stage design and pull weight range works well for a hunting rifle or a rig for PRS competition. 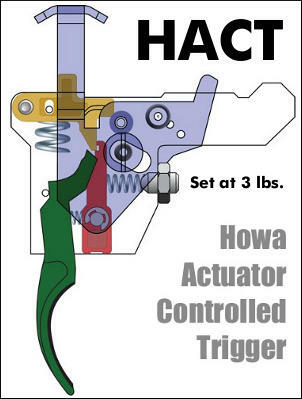 Rifleshooter.com says the Howa trigger is “one of the best factory triggers, along with Tikka. I’ve found the Howa trigger superior to a Remington 700 — the Howas doesn’t need to be replaced. 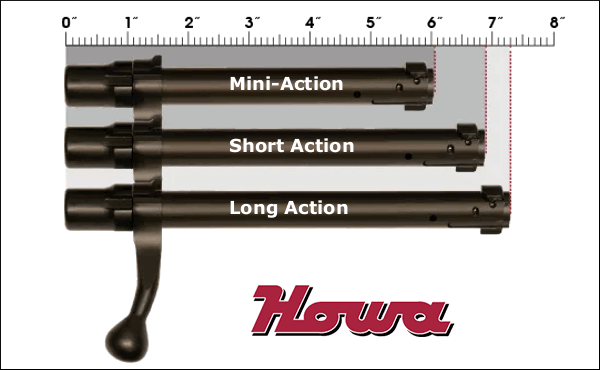 Howa offers three action lengths: Mini, Short, and Long. You can see the bolts for the three action lengths in the image below. The Mini-Action has similar external dimensions to the Remington Model Seven, however, the Mini-Action’s bolt does not travel as far to the rear. This is a mixed bag. The upside is you have a quicker action (shorter bolt throw). The downside is you are limited to shorter rounds such as the .223 Remington, 7.62×39mm Russian, and 6.5 Grendel. But if you need a bigger cartridge, just choose the standard or long action Howa variant. 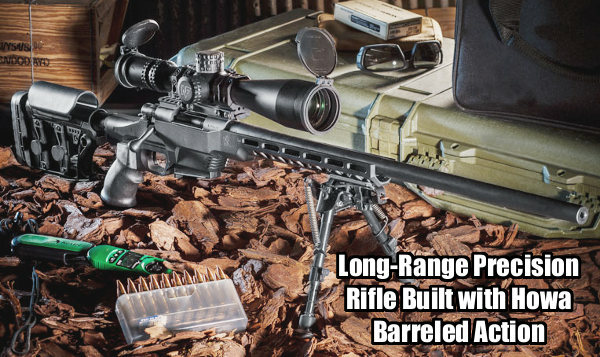 Is the Howa 1500 a Remington 700 clone, or some kind of improved Remington 700? No, not really. While the top radius of the Howa 1500 does match the Model 700, and they can both use the same two-piece scope bases, there area number of differences. If you look at the Howa 1500 alongside the Remington 700 you’ll note the M700 is a round action, while the Howa is a flat-bottom action. In many ways the Howa’s bottom half reminds me of a push-feed Winchester. This means the chassis and stocks that support a Howa 1500 are not V-block based like you’ll find on a 700, instead they have a flat bottom. While the bolt of the Howa is similar in external appearance to the Model 700, it does offer some improvements, notably an M16-style extractor and a firing pin assembly that can be easily removed without tools. Howa 1500 action screws are metric and are in a different location from the 700. The Howa 1500 has an integral recoil lug that accepts the front action screw, this means you have more of the front action screw engaging the action. WARNING: If you install it into a poorly-fitted stock or action you may bind it. Can a Howa Action Be Used for a Custom Rifle Project? Absolutely! You can either buy a barreled action from Brownells and throw it in a chassis system/stock of your choice or you can use a stripped action to build a custom rifle. If you are in the chassis market, MDT offers a wide variety of chassis in different price ranges. All have worked well for me. Q: Is it difficult to remove a barrel from a Howa 1500? A: Not very. I’ve heard from some smiths that worked on Howas (years ago) that the factory barrels are difficult to remove. However of the half dozen or so Howa barrels that I’ve pulled, they’ve been very easy. I use a Brownells action wrench with the top piece for a Rem Model 700 and the flat bottom resting against the flat on the wrench. I have built a few customs with Howa actions. Below is one of my favorite, a .308 Winchester. It consists of a Howa 1500 action, Shilen Select Match Remington Varmint contour barrel, and Modular Driven Technologies (MDT) ESS chassis. Great rifle and it hammers! To learn more about Howa rifles and actions, visit Legacy Sports International. To buy a Howa barreled action, visit Brownells.com. Share the post "Howa How-To: Basics of Howa Rifles and Barrel-Swapping Tips"
Great “Bang for the Buck” — If you’re looking for a hunting rifle for your son or daughter, here’s a very good gun that’s light-weight and sized for youngsters. 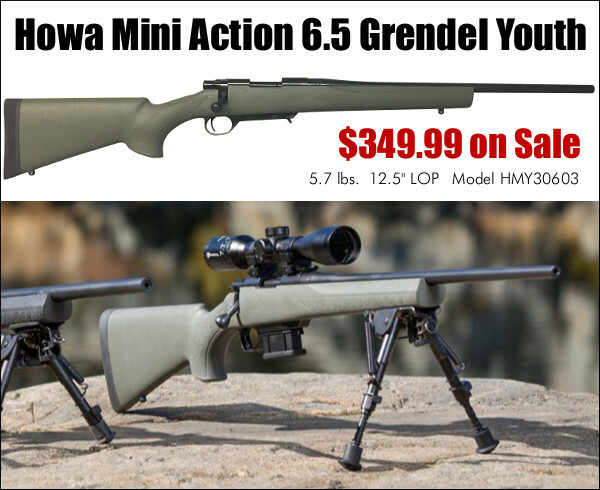 Right now the Howa Mini Action Youth Model in 6.5 Grendel is just $349.99 at Whittaker Guns. This special Youth model has a shorter stock with 12.5″ length of pull. Weighing under 5.7 pounds with 20″ barrel, this rifle is light enough for a boy or girl to carry easily. Factory hunting ammo is available from Federal, Hornady, and Alexander Arms. 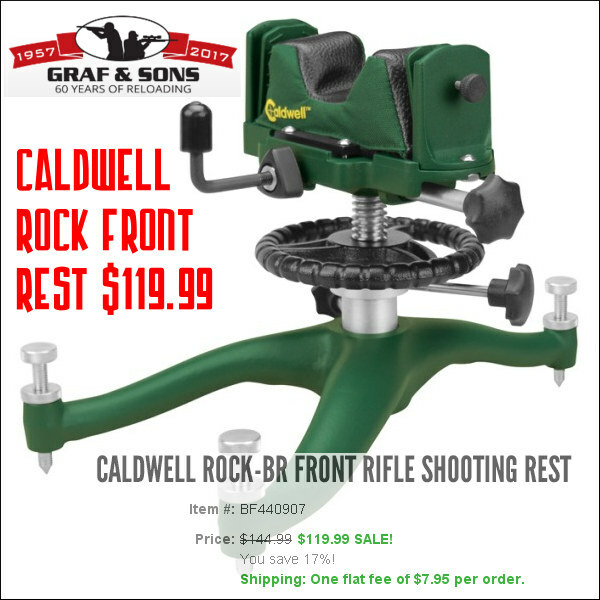 The Caldwell Rock BR Front Rest is sturdy and stable. It ships with two front bags, a wide tri-lobe plus a conventional bag (shown above). The latter works quite well for rifles with narrow forearms — such as hunting rigs or ARs. This is a good option for a young shooter or someone getting started on a tight budget. We’ve used this rest on a varmint hunt and it worked well. Use the Mariner wheel for gross elevation changes and “fine tune” elevation by squeezing your rear sand bag. This same rest costs $139.61 at Amazon. Save $20.00 by purchasing through Grafs which also offers a single, flat $7.95 handling fee per order — no extra shipping charge. Purchase multiple items from Grafs.com and pay just one $7.95 fee. 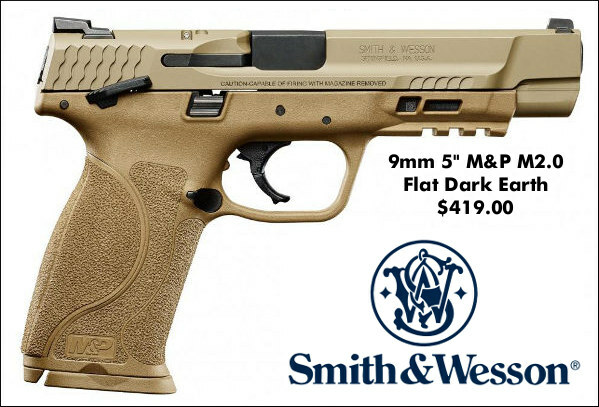 Here’s a good deal on a very reliable, accurate full-size 9x19mm pistol — the Smith & Wesson M&P 9mm in handsome Flat Dark Earth finish. We like the distinctive color with contrasting matte black ambidextrous controls. This 9mm pistol is now on sale for $419.00. When we featured this same pistol in September, it proved very popular and sold out at the vendor. If you like it, you might want to act soon. 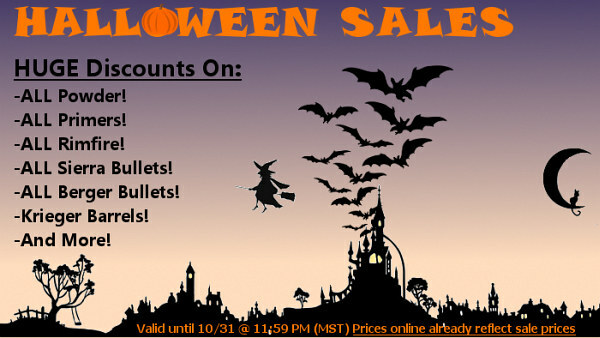 To mark Halloween, Bruno Shooters Supply is running a store-wide sale this Monday and Tuesday (through 10/31/2017 at 11:59 PM). There are notable savings on a wide range of products including powder, bullets, brass, primers and even premium-quality Krieger barrels. If you need reloading components, or a new barrel for your rifle, check out this sale — but don’t dawdle. Sale prices expire on Halloween Night, Tuesday, October 31st at 11:59 pm. 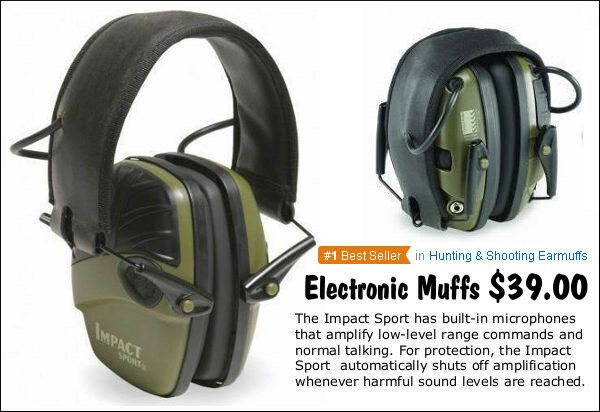 Every shooter should own a pair of Electronic muffs, even if you prefer shooting with earplugs and/or standard muffs. Electronic muffs are great when you are doing spotting duties or are working near the firing line. They allow you to hear ordinary conversations while still providing vital hearing protection. Right now Amazon.com has the Howard Leight Impact Sport Electronic Muffs on sale for just $39.00, with free Prime Shipping. This is good deal — these NRR 22 muffs are currently Amazon’s #1 seller in the category. This is a good little rifle in our favorite varmint chambering. With ballistics far superior to a .22 LR, the 17 HMR is ideal for prairie dogs and small varmints out to 180 yards or so. Now you can get a reliable, name brand 17 HMR rifle for a very attractive price. CDNN Sports is selling the 17 HMR Ruger American Rimfire Compact, with 18″ barrel, for just $269.99. That includes two (2) comb units and a FREE padded carry sling. FFL required. This double-duty product safeguards your firearms during transport AND provides a comfortable foundation when shooting prone. With a solid 4.5-star rating (240+ reviews) this item has impressed rifle-owning purchasers. Right now this product is being offered for around $52.00, a bargain considering all it can do. This versatile product performs multiple tasks and would be well-suited for PRS competitors. If you read the reviews you’ll see that recent purchasers have been very happy: “Superb for the money”; “Very practical”; “Really nice and well-constructed”; “Heavy Duty and versatile”. Share the post "Bargain Finder 110: AccurateShooter’s Deals of the Week"
We like Howa 1500-series rifles. The major attractions are the smooth-running action (feels almost like a custom), a very good two-stage trigger (way better than most domestic factory triggers), pretty decent barrels, and excellent fit and finish. Howa also offers a “mini” action that’s nearly an inch shorter than a conventional short action. The only negative is that the Howa actions have metric barrel threads. That complicates the re-barreling task for some gunsmiths who don’t have the right equipment. All-in-all the Howa 1500 series is still a fine value, offering excellent “bang for the buck”. If we were choosing a new varmint or hunting rifle, the Howa would be one of our first choices. Designed for PRS “factory class” competition and tactical applications, the Howa HCR offers the smooth-running 1500 action with HACT 2-Stage trigger in a fully-adjustable aluminum chassis. 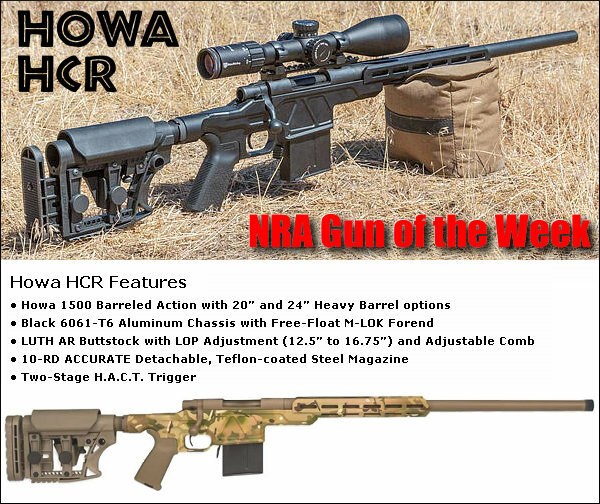 The Howa’s MSRP is $1299.00, with “street price” around $990.00 in black or $1180 with Camo finish so the HCR is directly competitive with the Ruger Precision Rifle (RPR). Available chamberings are: .223 Remington, .243 Winchester, 6.5 Creedmoor, and .308 Winchester. Mounted on an AR-style buffer tube system, the Howa HCR utilizes the fully adjustable LUTH-AR MBA-3 stock. Length of Pull is adjustable from 12.5″ to 16.75″. Comb height is also adjustable to fine tune for scope height-over-bore. Weight with a 24″ barrel is 10.2 pounds (before optics), so this Howa HCR is lighter than many similar rifles on the market. Share the post "Howa HCR Rifle Named NRA Gun of the Week"
Howa makes excellent, smooth-running actions, and the Howa HACT 2-stage trigger is WAY better than most domestic factory triggers. Right now you can save big bucks on Howa 1500 barreled actions, complete with HACT trigger and trigger-guard. Pacific Tool & Gauge (PT&G) sourced a truckload of Howa barreled actions, which are now on sale. Available at $250.00 are: .204 Ruger, .223 Rem, .22-250. All these chamberings are offered with either light- or heavy-barrel contours. There is no extra charge for factory camo finishes. 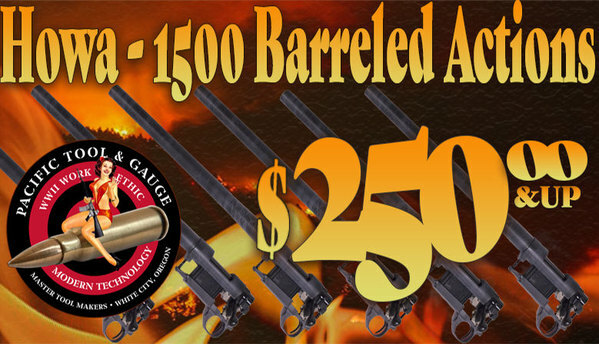 Guys, this is an incredible deal — you can get a complete high-quality barreled action for less than the cost of a custom barrel. If you’re looking to put together a varmint rifle project this is a great option — just add the stock and scope of your choice. These barreled actions would be great for custom hunting/varmint rifle projects — many have factory camo finishes. Howa barrels typically deliver easy sub-MOA accuracy (and often much better). NOTE: Some of these barreled actions may carry Weatherby or Nosler markings, but they were all made at the Howa factory in Japan. PT&G’s Howa 1500 barreled actions feature the very nice Howa HACT trigger. This is an adjustable, two-stage trigger, set for about 3 pounds (combined stages). Crisp and repeatable, this is an excellent trigger for a factory gun. In our opinion, the HACT trigger is clearly superior to the trigger on the Ruger RPR, as well as the Savage AccuTrigger. And there is no annoying Glock-style safety lever in the middle of the trigger blade. The 2-stage design and pull weight range works well for a hunting rifle or a rig for PRS competition. Share the post "PT&G — Howa 1500 Barreled Actions with Trigger, $250.00"
Here’s a great deal if you are looking for a smooth-running 6.5 Creedmoor rig in a modular chassis for PRS and tactical competitions. Right now you can get the Howa HCR chambered in 6.5 Creedmoor for just $867.00 at Bud’s Gun Shop (Check, eCheck or M/0 price). The new Howa HCR (Howa Chassis Rifle) combines a Howa 1500 barreled action with a modern, fully-adjustable aluminum chassis. MSRP for this HCR rifle is $1299.00, so this $867.00 price is a great deal for a 6.5 Creedmoor Howa with a very good two-stage trigger and 1:8″-twist 24″ barrel. Other chamberings are: .223 Remington, .243 Winchester and .308 Winchester (price may vary). Mounted on an AR-style buffer tube system, the Howa HCR utilizes the fully adjustable LUTH-AR MBA-3 stock. Length of Pull is adjustable from 12.5″ to 16.75″. Comb height is also adjustable to fine tune for scope height-over-bore. Weight with a 24″ barrel is 10.2 pounds (before optics), so this Howa HCR is lighter than some similar rifles on the market. The HOWA HCR features an adjustable, two-stage HACT trigger, set for about 3 pounds (combined stages). Crisp and repeatable, this is an excellent trigger for a factory gun. In our opinion, the HACT trigger is clearly superior to the trigger on the Ruger RPR, as well as the Savage AccuTrigger. And there is no annoying Glock-style safety lever in the middle of the trigger blade. NOTE: For all chamberings, 24″ barrels are offered, with 20″ options for the .223 Rem and .308 Win as well. Twist rates are 1:9″ for .223 Rem, 1:10″ for .243 Win, 1:8″ for 6.5 Creedmoor, and 1:10″ for .308 Win. We think .243 Win shooters will NOT be happy with the 1:10″ twist. We would prefer to see a 1:8″-twist for the .243 Win so it can shoot the 105-115 grain 6mm bullets. Most competitive 6mm shooters will want a true 8-twist or even a 1:7.5″. Share the post "Great Deal on 6.5 Creedmoor Howa for PRS and Tac Comps"
Everyone needs a good .22 LR rimfire handgun, and the Browning Buck Mark is a classic. This stainless, bull barrel version is marked down this week to $329.99. That’s a very good deal, but you can save even more with Browning’s $50 Rebate. Buck Marks, with their excellent triggers and great ergonomics, are fun to shoot and VERY accurate. This is a pistol you can keep for a life-time. Browning says: “Every Buck Mark starts out as a solid piece of aircraft-grade 7075 aluminum alloy, and then is CNC-machined to exacting tolerances. The crisp single-action trigger, hand reamed chamber, target crowned barrel and finely adjustable target sights mean the Buck Mark comes ready for fun straight from the box.” There is also a blued Buck Mark version priced at $289.99 (or $239.99 after Rebate). 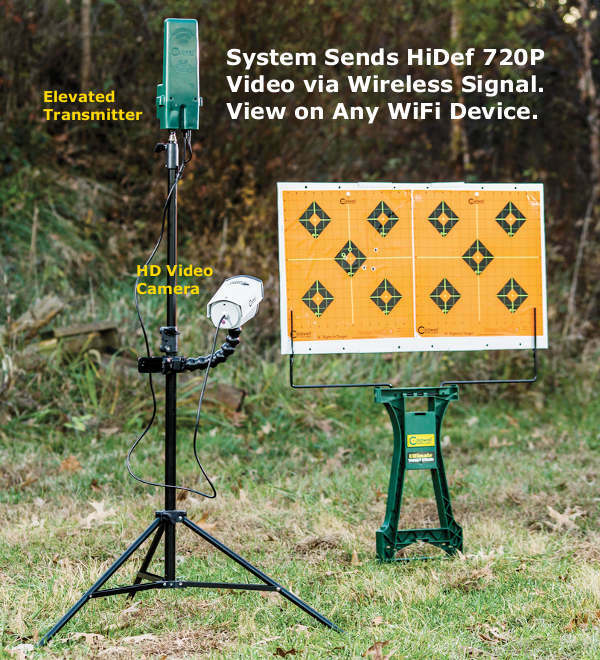 Forum members have purchased this Caldwell Target Cam System and they’ve found that it works reliably, providing a clear signal to any WiFi-enabled mobile device (smartphone, iPad, Laptop). One member specifically tested the unit at 1000 yards and it functioned fine. NOTE: This system does NOT have a zoom camera lens, so you need to position the camera within 10 yards or so of the target. But if you place it to the side a bit, this shouldn’t be a problem. This system comes with a nice, fitted carrying case that holds camera, transceivers, antennas, and stands. You get a very capable system for under $330.00. Graf’s offers free shipping after a flat $7.95 handling charge. Midsouth Shooters Supply is now carrying the advanced Labradar chronograph. This unique unit allows you to measure your shots without having to set up a tripod and skyscreens downrange. 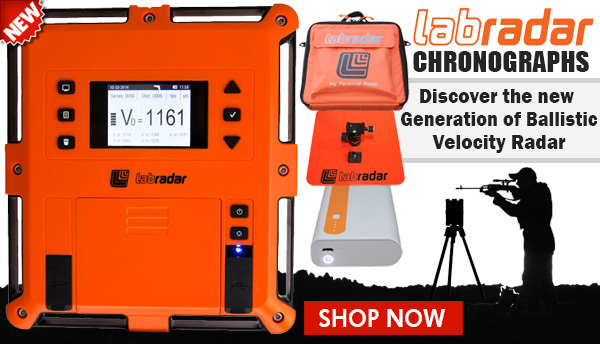 When you start using a Labradar, you’ll never want to go back to old-style chronographs. You can also purchase the Labradar from Bruno Shooters Supply. Price is $559.95 from either vendor. NOTE: Very soon Labradar plans to offer Bluetooth functionality, allowing you to control the machine remotely with your mobile device. This functionality will come via new software — the Bluetooth transceiver is built-in to all current Labradar units, so you can buy one now and use Bluetooth later (when the software is released). 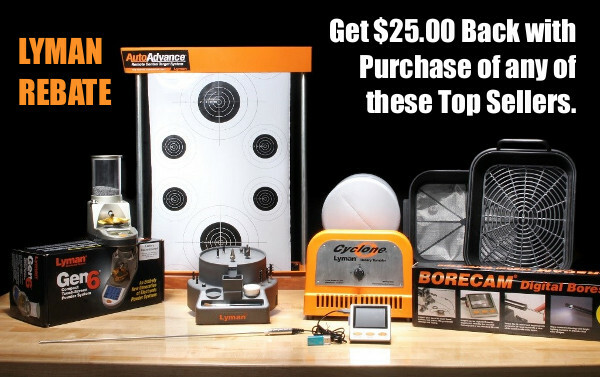 You can now get $25.00 Off five of Lyman’s top-selling products: BoreCam, Case Prep Xpress, Gen6 Powder Dispenser, Cyclone Rotary Tumbler, and AutoAdvance Target. With Lyman’s Summer Mail-In Rebate Program, you can earn a $25 rebate per select item bought from any Lyman dealer, online or direct from the Lyman website. Items must be purchased between June 9 and August 31, 2017 to qualify. CLICK HERE for the Rebate Redemption Form. 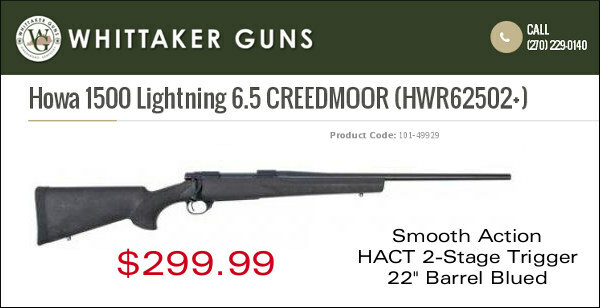 With this deal you can get a complete 6.5 Creedmoor Howa 1500 Rifle with HACT 2-Stage Trigger for just $299.99. That’s $150.00 less than the price of a Howa 1500 barreled action by itself! ($449.99 at Brownells). This is a no-frills rifle, but its hard to beat the $299.99 price for a solid, multi-purpose rifle. Use “As-Is” for hunting or drop it into a modular stock for tactical/practical games. Even if you have a good set of calipers, you may want to get one of these Neiko 01407A Digital Calipers. The #1 best-selling digital caliper on Amazon.com, this Neiko tool features a large LCD Screen and measures up to 6.0 inches. With 2850+ customer reviews, this product has earned an overall rating of 4.4 out of 5 stars. It’s hard to go wrong for $16.79, even if you just use these as a spare set for measuring group sizes and case trim lengths. Need 17 HMR ammo for your planned 2017 varmint safaris? Then grab this Hornady V-Max ammo while you can at $9.75 for a 50-round box. This is a great price. 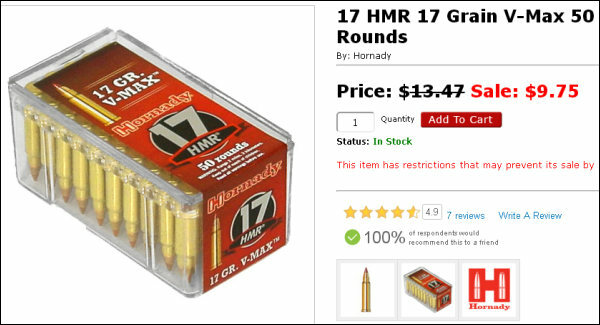 Other vendors are selling the same Hornady ammo for as much as $13.50 per box. We’ve used this ammo and it was very accurate out of both semi-auto (Savage A17) and bolt-action (CZ 455) 17 HMR rifles. 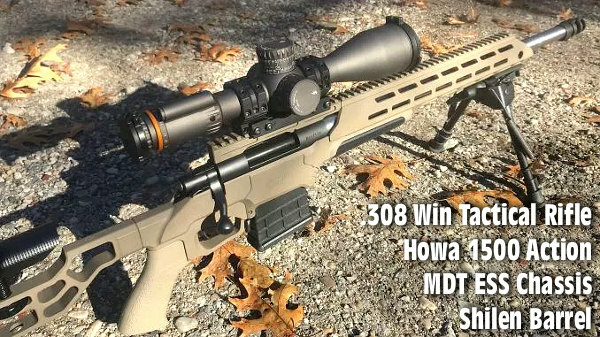 Share the post "Bargain Finder 91: Accurateshooter’s Deals of the Week"
RifleShooter.com built this rig with Howa 1500 barreled action and MDT ESS chassis. READ TEST HERE. We’ve been telling folks that the Japanese Howa 1500 barreled actions are an attractive option for a hunting, varminting, or tactical rifle. 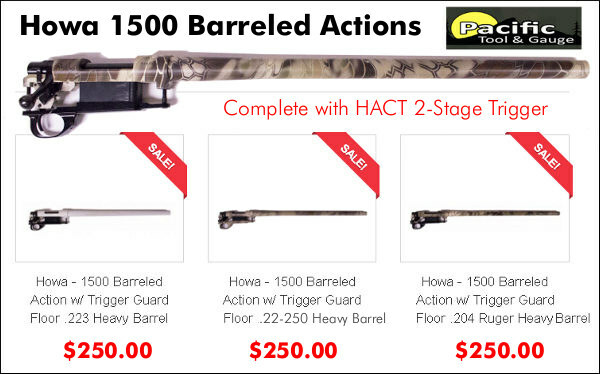 Priced at under $450.00, these barreled actions include the excellent HACT two-stage trigger. These Howa 1500 actions are smooth-running (noticeably more so than some “major-brand” domestic receivers). Our friends at RifleShooter.com recently acquired a Howa 1500 barreled action in 6.5 Creedmoor and installed it in an MDT ESS modular chassis. This project turned out well. The barreled action mated well to the ESS chassis, providing an ergonomic platform with comfortable grip, adjustable cheekpiece, and adjustable LOP. Most importantly the gun shot well. With virtually no load development, the project rifle delivered 3/4-MOA accuracy right out of the gate. 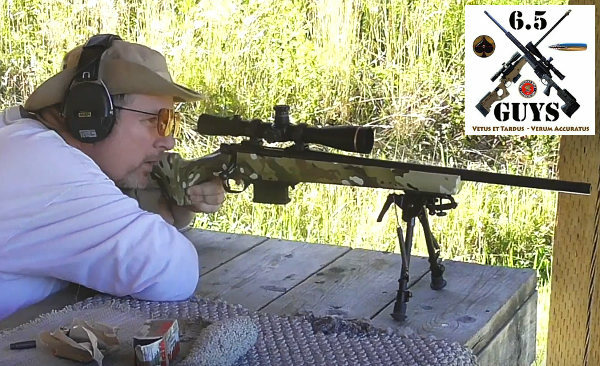 As tested with Hornady brass and Hodgdon Varget powder pushing Sierra 123gr MatchKings, the Howa 1500 MDT showed good accuracy right from the start. With more load development (and a few more rounds through the new barrel), half-MOA groups may be possible. 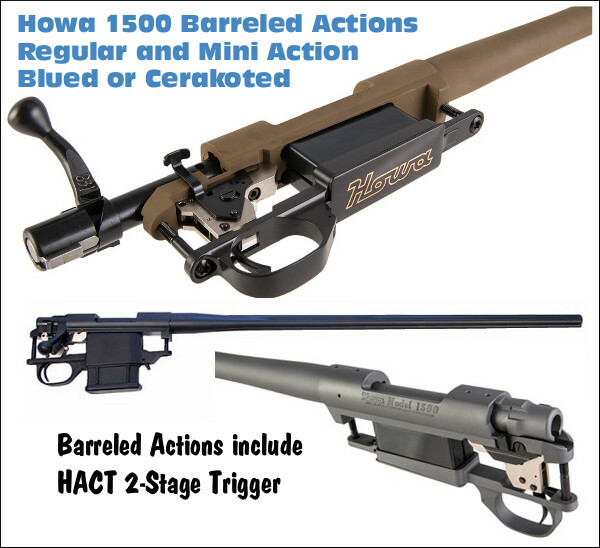 Brownells now sells barreled Howa actions in a variety of configurations. Rifleshooter.com acquired a Howa 1500 barreled action with a 24″ #6 contour barrel chambered in 6.5 Creedmoor. RifleShooter.com plans to test this barreled action in multiple modular chassis systems. That should provide an interesting comparison test, providing the pros and cons of various stock/chassis configurations. 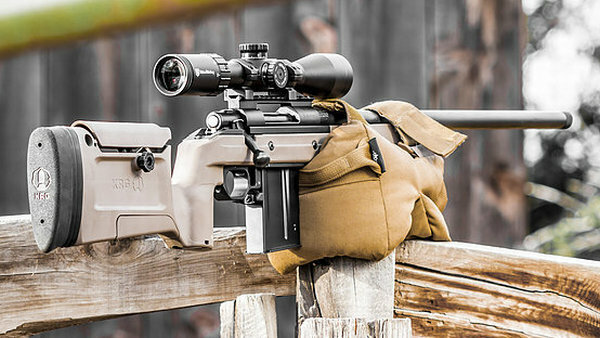 RifleShooter.com’s Editor writes: “I was pleasantly surprised by the number of chassis and stock offerings for the Howa barreled action.” For this project rifle, RifleShooter.com chose the Modular Driven Technologies (MDT) Elite Sniper System (ESS) chassis, for the initial build. Like MDT’s other chassis systems, the ESS uses any AR-15/M16 M4 pistol grip. The ESS departs from the rest of the MDT product line it does not use a standard AR-15/M16 M4 stock. Eliminating this interface allows for a design that does not increase the length of pull. The stock has an adjustable comb, adjustable length of pull, and horizontally adjustable recoil pad. Comb and LOP adjustments are accomplished with a hand wheel, plus a cap screw and clamp system. 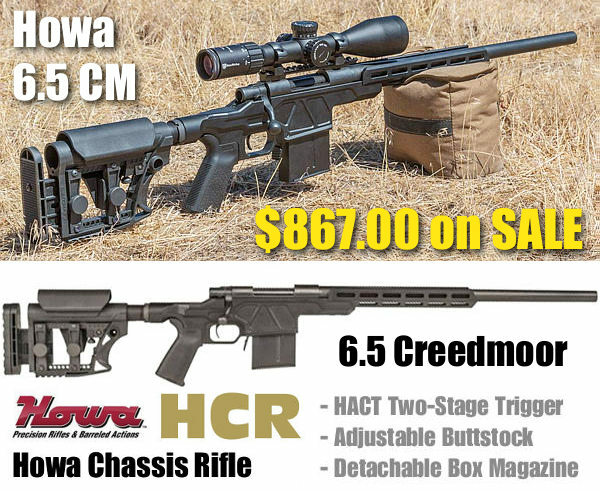 Share the post "6.5 Creedmoor with Howa 1500 Barreled Action in MDT Chassis"
Here is a great deal on a great little rifle. 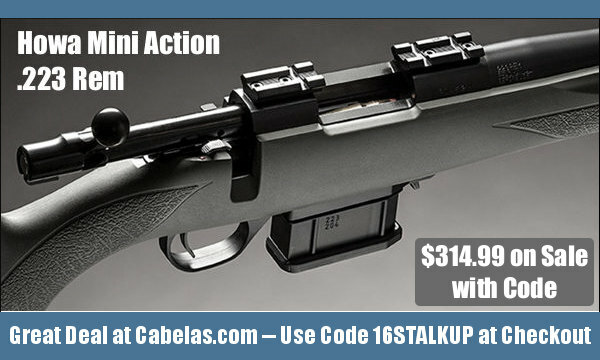 Right now at Cabela’s you can get the Howa 1500 Mini-Action in .223 Rem for just $314.99 with Coupon Code 16STALKUP. The rifle (with black synthetic stock) is already on sale, marked down to $349.99. That discount code gives you another 10% off. That’s a bargain — other vendors are charging $515.00 or more for this rifle. We actually “walked through” the online ordering process ourselves to confirm that the discount code works (see below). Note, you order online, but the rifles must be picked up in a Cabela’s store. The Howa 1500 Mini Action is nearly an inch shorter than a Rem 700 short action, making for a nice, compact carry-around varminter (OAL length is just 41.5″). Your Editor checked out the Howa Mini Action Rifle at SHOT Show. The bolt opens and closes VERY smoothly (way better than most mass-produced bolt guns). The two-stage HACT trigger is excellent — it’s plenty light, with a crisp release and no annoying spring-loaded blade in the middle. I like it MUCH better than standard Remington, Ruger, or Savage triggers. The standard Howa Mini Action rifle weighs 6 pounds without scope. This particular model comes with a 22″ barrel, black synthetic stock, and 10-round detachable box magazine. The Howa Mini on sale at Cabelas.com is a .223 Remington, but other chamberings are available at a higher price if you shop around. 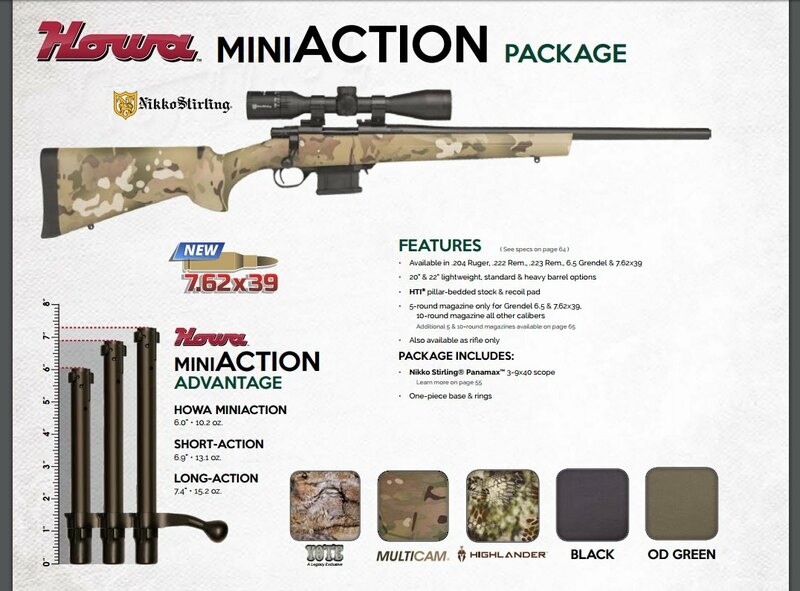 Howa offers Mini Action rifles in .204 Ruger, .222 Rem, .223 Rem, 6.5 Grendel, and 7.62x39mm. 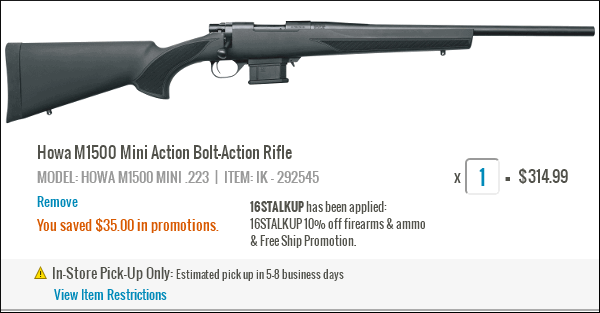 Share the post "Awesome Deal on Howa 1500 Mini Action Rifle in .223 Rem"
Can a budget-priced Savage shoot like a Sako TRG 22? Well, adding a custom “pre-fit” barrel and a state-of-the-art chassis system can transform a “Plain Jane” Savage into a serious tactical rifle. And now Kinetic Research Group (KRG) offers a new fully-adjustable chassis that’s just the ticket for a Savage tactical conversion. Just get a used Savage action, spin on a Criterion, Pac-Nor, or Shilen pre-fit barrel, and add the new 180-Alpha Chassis from KRG. 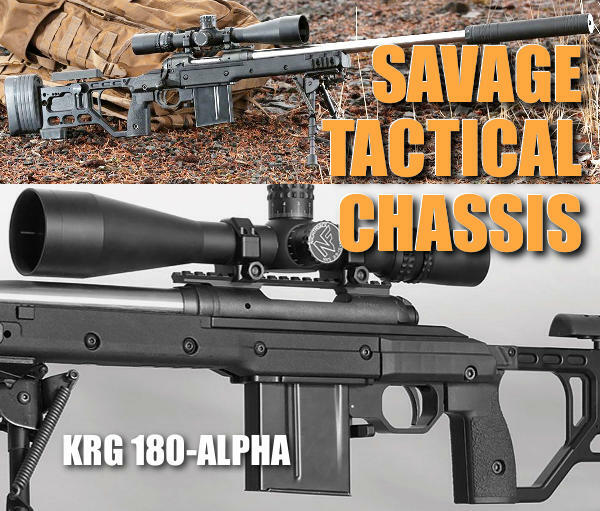 KRG offers 180-Alpha Chassis for Savage rifles. This fully-adjustable, light-weight (3.5 lbs) chassis fits Savage short action rifles with 4.4″ action bolt spacing. The 180-Alpha features tool-less cheek-piece height adjustment, spacer Length-of-Pull (LOP) adjustment, buttpad height adjustment, and plenty of accessory mounting positions. 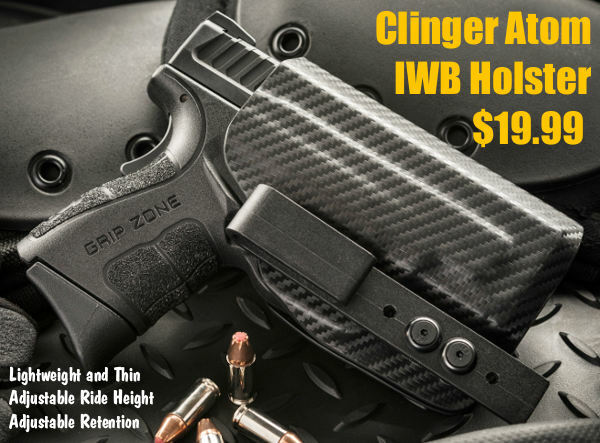 Suggested retail price for the 180-Alpha starts at $768.00 for the side bolt-release version. A bottom-release model is slightly more. CLICK HERE for Specifications of KRG 180-Alpha Stock for Savages. Compare KRG’s 180-Alpha Chassis to the hardware on the real deal — a Sako TRG 22 with adjustable, folding stock (model JRSM416, shown below). This SAKO TRG22 rifle in .308 Winchester retails for $5,198.00. With KRG’s 180-Alpha chassis you can put together an ergonomically-similar tactical rifle for thousands less. Using the KRG Chassis, a take-off Savage action, and a premium pre-fit barrel, you can build a similar system for around $1540.00. Here’s how we get that figure: $370.00 for Criterion pre-fit barrel, $400.00 for action (YMMV), and $768.00 for stock (Total $1538.00). KRG produces other adjustable, modular chassis systems for bolt-action rifles. KRG’s popular Whiskey 3 Chassis system fits the Tikka T3, Remington® 700™, Sako M995, Badger M2008, and 700 Long Action. The KRG X-RAY Chassis fits the Rem 700 Short Action, and Tikka T3, and the 180 X-RAY fits the CZ-455, Howa 1500, and Weatherby Vanguard platforms. Product Tip by EdLongrange. We welcome reader submissions. Share the post "KRG 180-Alpha Tactical Chassis for Savage Actions"
If you need a good, basic mid-range zoom for a hunting rifle or general-purpose rifle, this deal is hard to beat. Choose either 4-12x40mm or 3-9x40mm for just $129.95. And there’s free shipping to boot! Both scopes feature Nikon’s patented BDC reticle and are backed by Nikon’s no-nonsense, lifetime warranty. 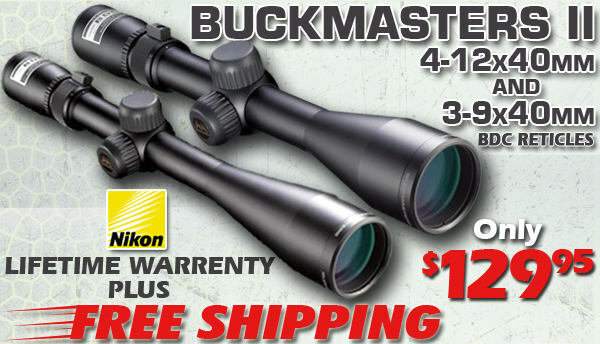 CLICK HERE to see this offer at Midsouth Shooters Supply. Here’s a great deal on an outstanding hunting combo. 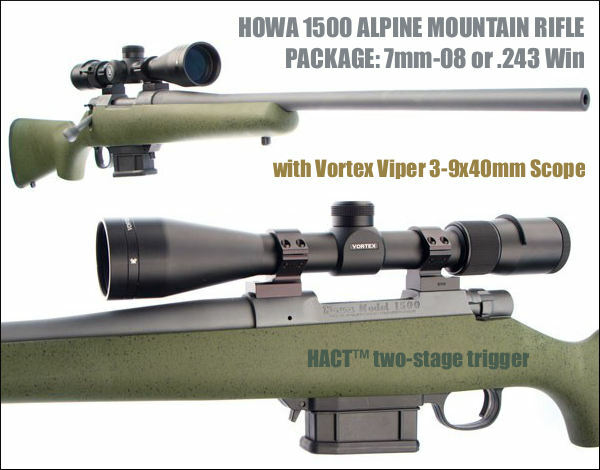 You get a complete Howa 1500 Alpine rifle PLUS a quality Vortex Viper 3-9x40mm scope for $899.99. Two chamberings are available with this package. Select the 7mm-08 model for bigger game or choose the .243 Win model for predators and varmints. The Howa 1500 has a smooth-running action and excellent 2-stage HACT trigger. 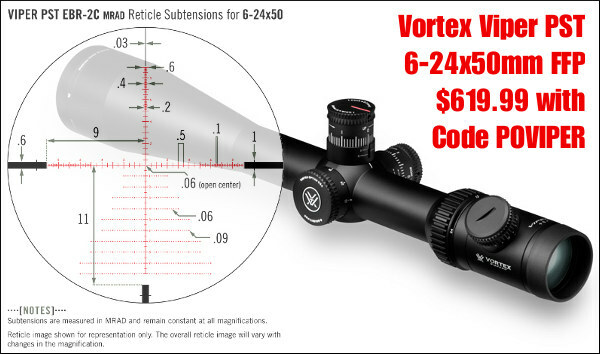 The highly-regarded Vortex Viper scope sells elsewhere for $300.00 or more by itself. A few Forum members have purchased this system and they’ve found that it works reliably, providing a clear signal to any WiFi-enabled mobile device (smartphone, iPad, Laptop). One member specifically tested the unit at 1000 yards and it functioned fine. NOTE: This system does NOT have a zoom camera lens, so you need to position the camera with 10 yards or so of the target. But if you place it to the side a bit, this shouldn’t be a problem. This system comes with a very nice, fitted carrying case that holds camera, transceivers, antennas, and stands. You get a very capable system for under $400.00. Everything you see above can be yours for just $225.00, after manufacturer’s rebate. 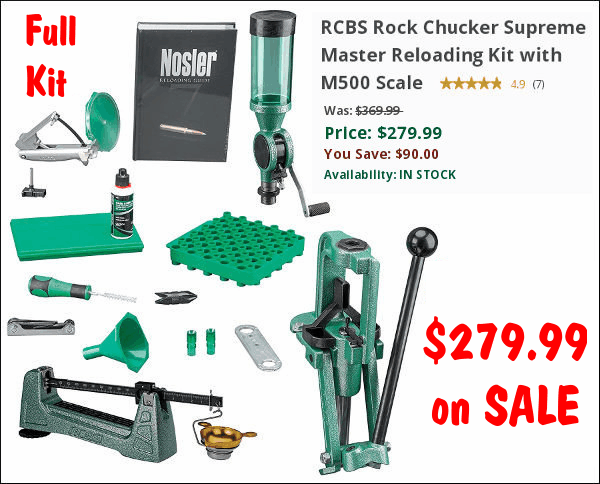 Right now, Cabela’s is selling the Rock Chucker Supreme Master Reloading Kit for $300.00. This Reloading Kit sells elsewhere for up to $360.00. 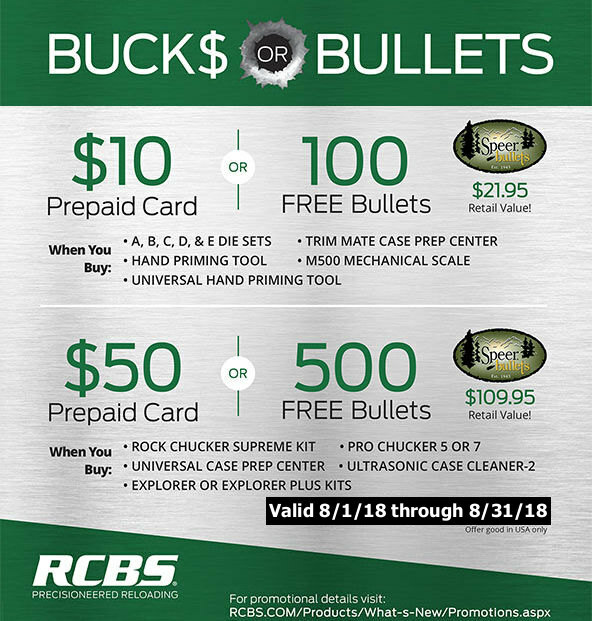 But he’s the real incentive — if you spend $300.00 on RCBS products in 2016, RCBS will send you a $75.00 rebate. 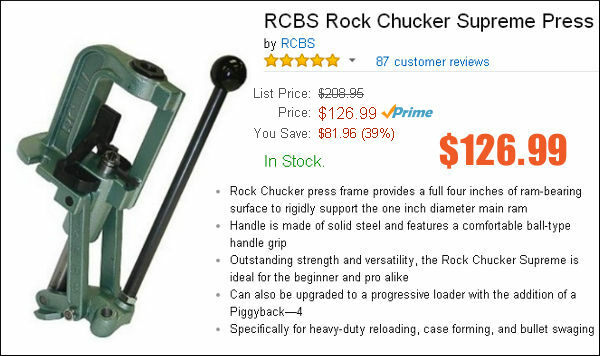 With that RCBS mail-in rebate, your net cost is just $225.00 for the entire Kit. Looking for a quality, low-power variable optic for an AR or hunting rifle? Look no more. 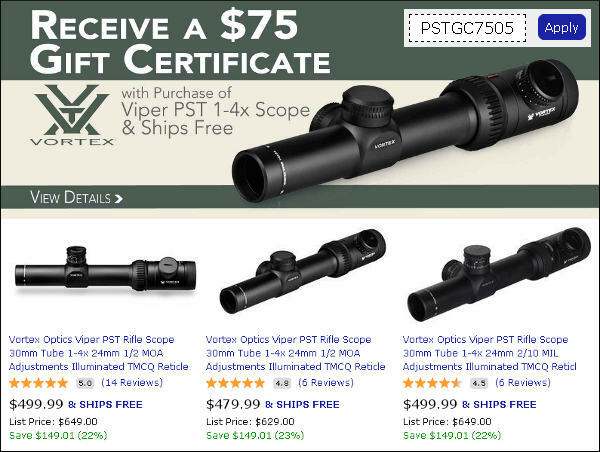 Right now, at MidwayUSA, you can get a $75.00 Gift Certificate with the purchase of a 1-4x24mm Vortex scope with either 1/2 MOA or 2/10 Mil clicks. And you won’t pay a penny for shipping as MidwayUSA is currently offering free shipping on orders of $150.00 or more. NOTE — 1/2 MOA (or 2/10 Mil) clicks are pretty course — this may NOT be precise enough more for Service Rifle Matches (1/2 MOA is about 3 inches at 600 yards). However the scope may be fine for 3-Gun matches or hunting. Shipping on orders of $100.00 or more. This offer expires today, May 23, 2016. We featured this Dewey Deal before, but it’s good enough to be spotlighted again this week. Right now you can get a quality Dewey Cleaning Rod from Natchez for under twenty bucks. These bearing-equipped rods are very well made and can last for many seasons. This editor has a couple Dewey rods that are still going strong after 12 years. For just $19.99, you can get either a 36″ or 44″ coated Dewey rod. NOTE: Select “.22-.26 cal” from the pull-down menu (the other options are for short pistol rods). It’s hard to beat a quality cleaning rod for under twenty bucks. Credit Boyd Allen for finding this bargain. Share the post "Bargain Finder 36: AccurateShooter’s Deals of the Week"
Here’s a new tactical-style rifle you should consider if you are involved in the Tactical/Practical shooting disciplines. It features a modern, adjustable Archangel stock with the smooth, made-in-Japan Howa 1500 action, outfitted with a detachable 10-round box magazine. Legacy Sports, distributor for Howa rifles, is offering the new Howa Archangel Rifle in .223 Remington and .308 Winchester. The ambidextrous, carbon-reinforced polymer stock features a click-adjustable cheek-riser, adjustable length-of-pull, grip storage compartment, plus front/rear quick-detach flush cups. There is also a clevet, integrated, push-button bipod attachment system. The Howa actions mate precisely into the stock and ride on aluminum pillars. 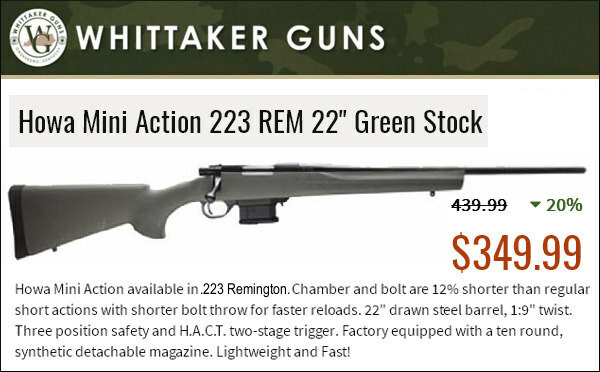 In .223 Rem or .308 Win, the complete rifle, with either 20″ or 24″ barrel, starts at $915.00 MSRP, including 10-round mag. We expect the actual street price to be around $800.00. That makes this a more affordable alternative to the Ruger Precision Rifle, which is commanding $1200.00+ these days (if you can find one). Note: Archangel Mfg. offers this Howa 1500-compatible stock in Black, OD Green, and Desert Tan, but it appears that the initial Legacy Sports complete rifle will be in black only. These rifles are fitted with the very good HACT adjustable two-stage trigger and 3-position safety. The Howa Archangel rifle is also available (for about $230 more) in a scoped package with a 4-16x50mm Nikko Sterling Scope (see below). For more information call Legacy Sports at 1-800-553-4229 or visit LegacySports.com. Note: If you already own a rifle with a Howa 1500 barreled action, you can purchase the Archangel AA1500 stock separately (MSRP $355.99) from Arizona-based Archangel Manufacturing. 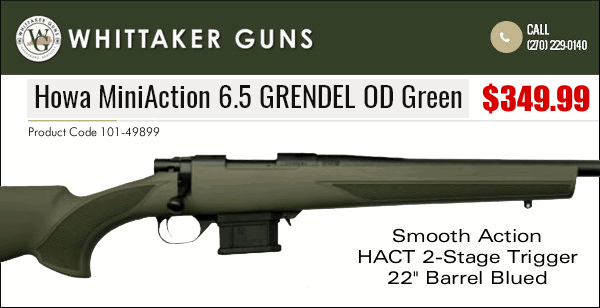 This company also offers similar stocks for Rem 700, Springfield M1A, and K98 Mauser barreled actions, starting at just $202.99 for the Mauser variant. Share the post "New Howa Tactical Rifle in Archangel Adjustable Stock"